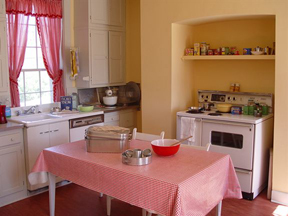 Remodeling a Retro Kitchen for less than $1000. In addition to kitchen stuff, we have a Calendar of Swing Dancing in DC, a Directory of Vintage Clothing Stores and a Guide to 1940s Collectibles. Thanks for tuning in! Feel free to Contact Me if you have questions or want to share photographs and appliance stories with the rest of the readers. 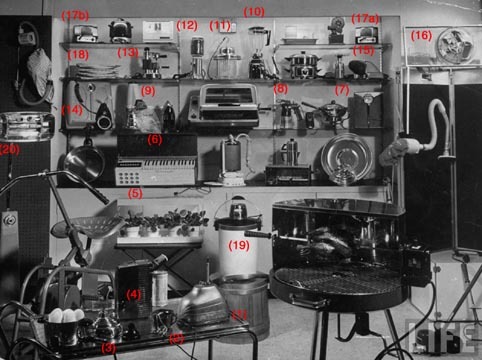 We recently received the following absolutely astounding photograph that came out of a LIFE magazine article on electrical appliances. 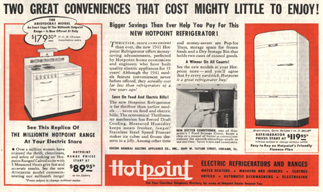 Here, preserved in one spot is a veritable treasure trove of 1950s electric appliances, many of which are discussed in great detail on this page or others in the jitterbuzz site. 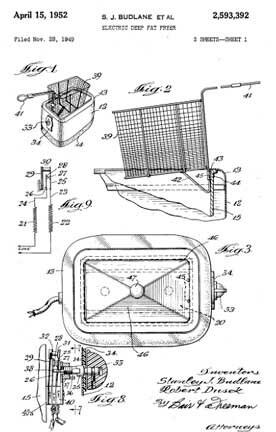 A very early electric insect trap or "bug zapper"
This is the famous Sunbeam Egg Poacher. I do not have one of these, but my reader Lynne sent me in a photo of her astoundiing collection and I felt that I must share it with others. 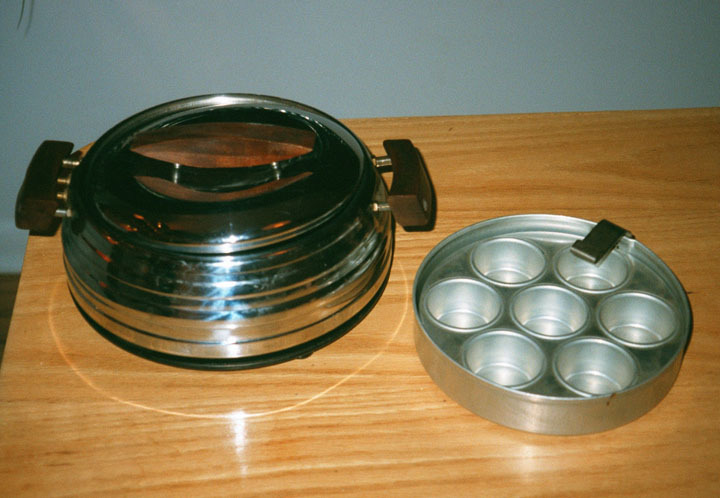 The Sunbeam egg poacher is basically a teakettle -- there is an electric heating element that boils a small amount of water. 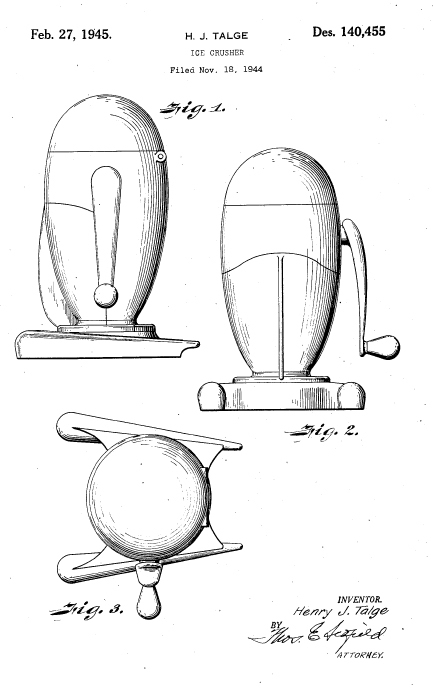 In turn, the steam cooks eggs in a variety of styles. 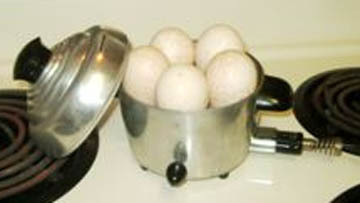 Shown below is the egg rack that makes hard- or soft- boiled eggs. 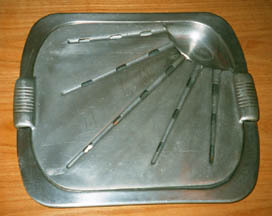 There is also a tray insert for making poached eggs. 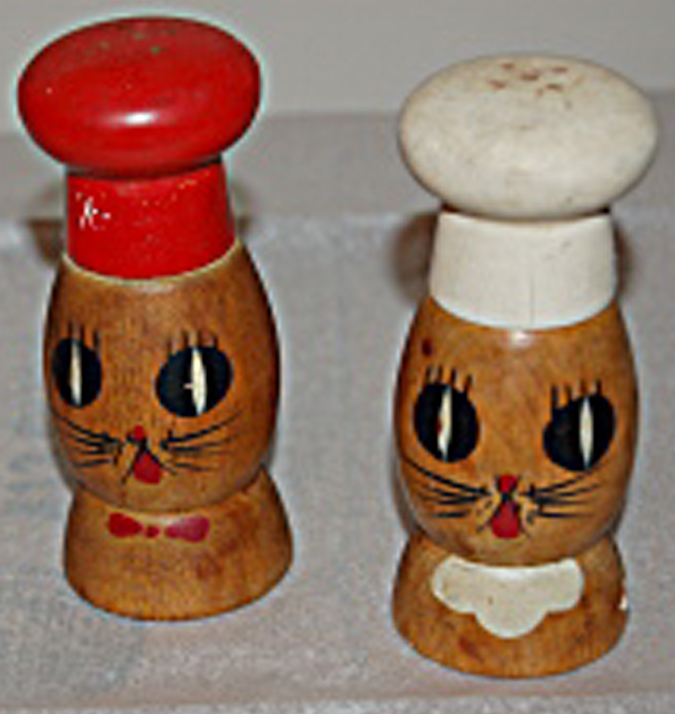 Click here to look at another type of collectible, or keep on scrolling for more Kitchen Stuff. This is the famous Revere Ware whistling teakettle. These have been around since 1950 and are still sold today. They work very well and I still use mine on a daily basis. 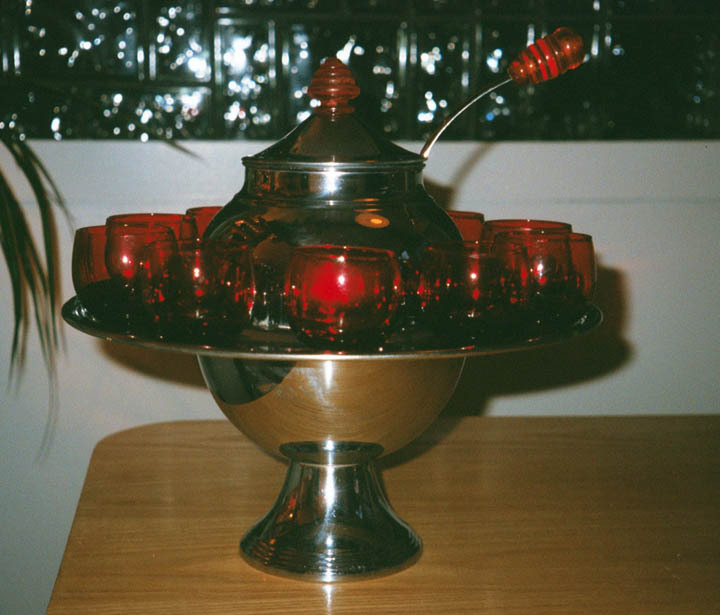 The Whistling Teakettle was designed by William A. Welden of the Revere Copper and Brass Company of Stamford, Connecticut, a well-known maker of fine Art deco chrome and copper objects. 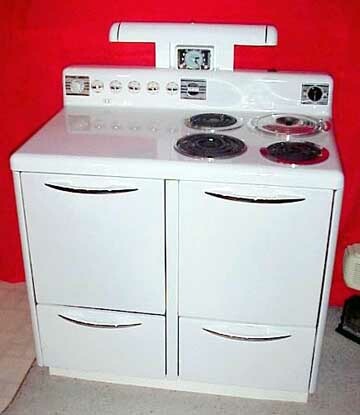 This was part of the company's "Revere-Ware" line which featured stainlesss steel cooking appliances with copper-clad bottoms. 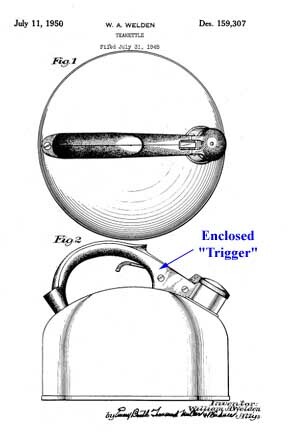 The line is still made today and the teakettle sells for about $25 -- however, if you want to buy a real vintage item, make sure that the "trigger" for the spout is fully enclosed. All of this brings us to Stanley J. Budlane and Robert Dusek of Chicago Illinois. In the postwar era, Americans developed quite a taste for Hamburgers and French Fries. Although anyone could make a burger, good fries were (and still are) a real rarity. 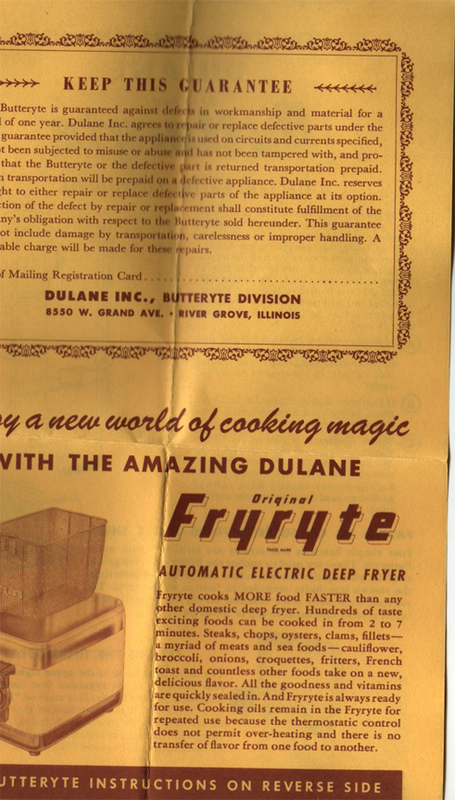 After sampling fried chcken, fish, onion rings and potatoes all over the Midwest, Budlane and Dusek pooled their ingenuity to create the FryRyte (they also pooled their names, calling the company "DULANE"). Their creation took most of the guesswork out of frying. They were among the first to systematically study the actual chemistry of frying. Through experimentation, they developed the optimum temperature for various fats and determined the depth of cooking liquid that was required to fry food both properly and economically. Prior to Budlane and Dusek, the volume of liquid and its temperature was a hit-or-miss prospect -- most people tried to fry chicken in a shallow skillet that left a portion unheated leading to a soggy, greasy mess. The old Southern "Fish Fry" tradition of a large cast iron kettle filled with molten lard led to tasty food, but required a considerable volume of oil and was suitable only for large gatherings. Without the ability to control temperature, it is quite easy to overheat the oil leading to very nasty-tasting oxidation products (that we also know today to be carcinogens!) Finally, all those little particles of food that break free can also oxidize and ruin the oil. Thus, if you wanted good fried food you had to use a lot of fat and then throw it away. The response was enthusiastic -- the FryRyte became an instant hit. 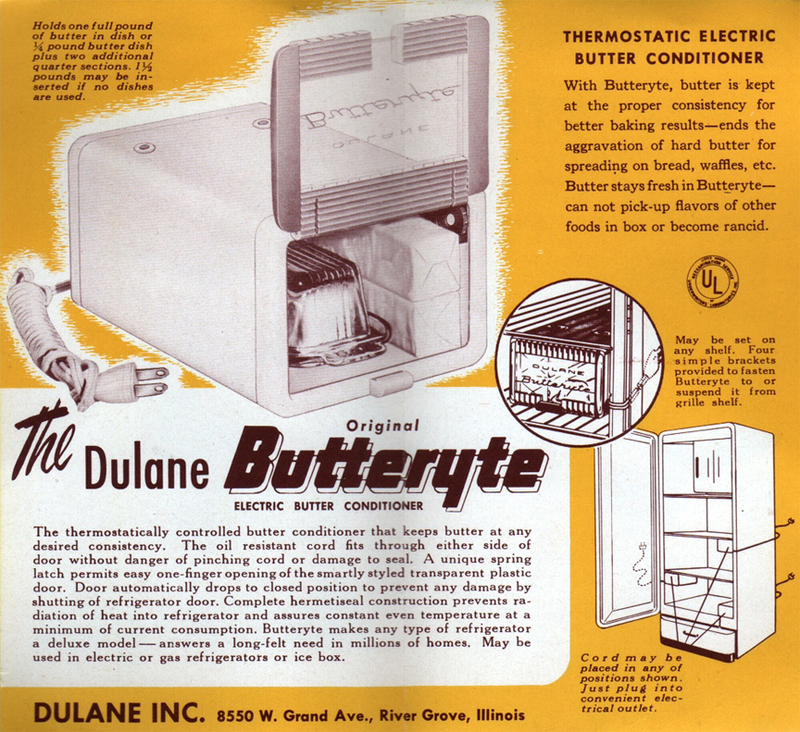 [Note below that Dusek and Budlane offered hundreds of taste tempting recipes in the books and manuals that accompanied the appliance.] Families across America enjoyed their newfound Postwar prosperity with fried foods by the ton, instilling a taste for breaded and fried goodies that has led, some 55 years later, to our National Obesity Epidemic. 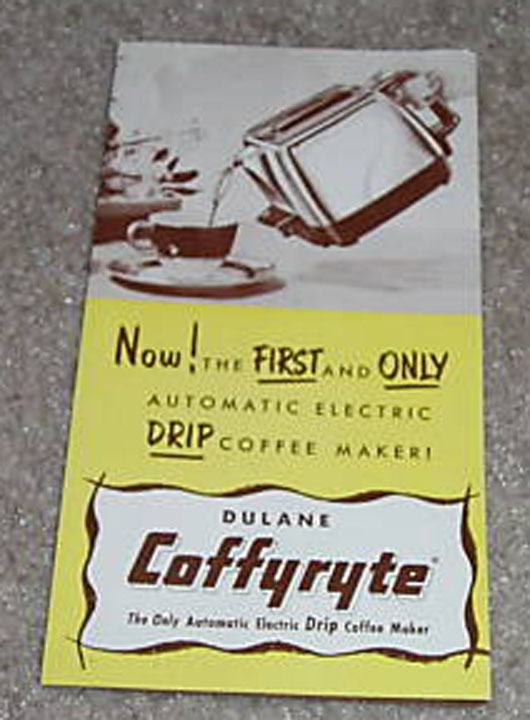 "... My grandfather was Stanley Budlane, the "lane" of "Dulane", makers of the FryRyte and CoffyRyte. I am kicking myself for feeling too overwhelmed with basement clutter to take advantage of an offer to take home my grandfather's Coffyryte. 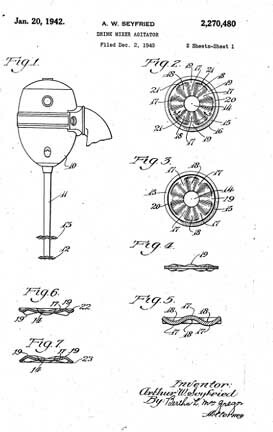 I have since come to my senses , researching my grandfather's company and wishing I had been able to spend more time learning about his inventions. He spent a great deal of time escaping my grandmother by toiling in his mysterious basement workshop. I wish I had gone downstairs and taken an interest, but I hung out with Grandma upstairs. ..."
By the way: If you drop onion rings, shrimp or green beans into hot oil, take them out and drain them, they absorb little or no oil. But most deep-fried foods are first coated in a batter (flour, egg, breadcrumbs) because that's what makes them crispy. This coating absorbs the oil -- less if it's fried "perfectly", but still more than non-fried foods. It's not just added calories that make deep-fried food less healthful; it's the high heat. The crunchy coatings of fried foods are primarily starch; so are potatoes (French fries). When starches and sugars are browned in hot oil, they form Advanced Glycation End Products (AGE's), that are carcinogens. What about deep-fried foods in restaurants? Fried foods in fast food and most other chain restaurants (french fries, onion rings, chicken nuggets, etc.) are loaded with partially hydrogenated fats, in addition to the AGE's. Continuing in the line of "Ryte" appliances, this is the Dulane Butteryte, an aftermarket butter conditioner that could be installed in your refrigerator (provided you were willing to drill a hole in the back...) The purpose of the gadget was to keep butter at a "spreadable" temperature without letting it go rancid. Briefly, the thing contains a heat source (sort of like an electric bulb) and a thermostat. It is heavily insulated and has a thermostat so that the temperature will remain at about 42 degrees, or so. 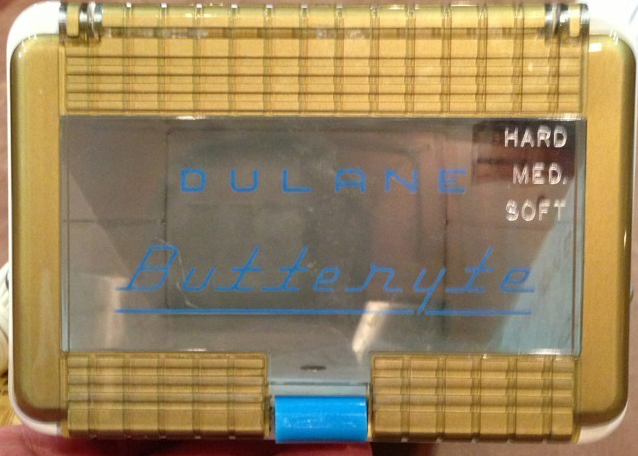 It has a very nice glass door that lets you see the butter inside and had little metal clips so that it could be hung from a shelf. 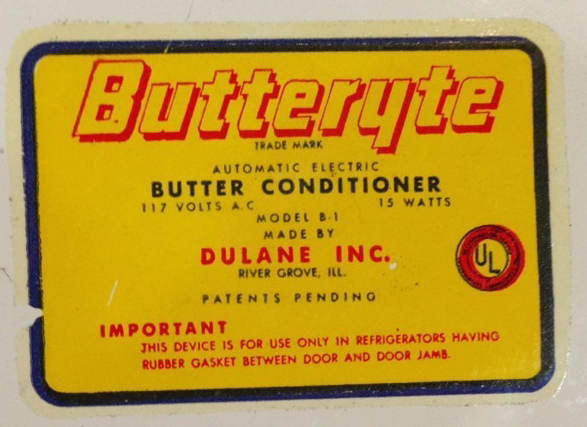 The Butteryte was marketed whens "butter conditioners" were an upscale feature on GE refrigerators. 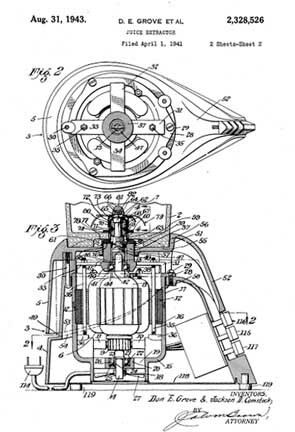 There are a number of patents related to design and thermostatic control. There is even a clever design for a hinge that permits to power cord to be unobtrusively routed to the device. This is a tricky problem in insulation -- to make sure that the door can be opened versus a "feedback loop" in which heat from the conditioner causes the refrigerator to work harder and then the conditioner must put out more heat. 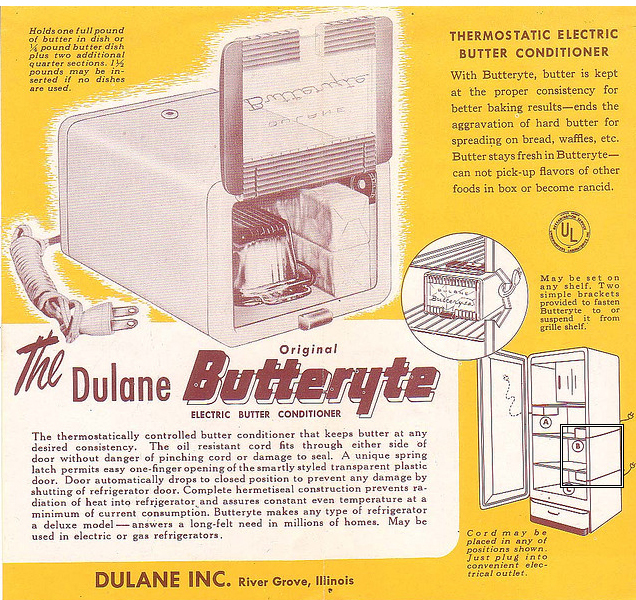 It was probably a good idea to offer an "aftermarket" butter conditioner, since people were willing to pay about $20 (in 1952) more for the accessory on a new refrigerator, sort of like an "ice maker" is today. Our best estimate is that it sold for something like $12-$15 in 1952, something like $100 in 2013. (It wasn't cheap) The wholesale price was about $9, so the retailer made a $6 profit on each unit. 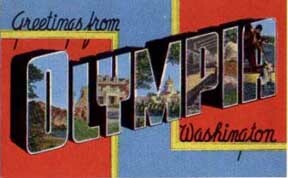 Our reader Vicki in Olympia found it at a flea market for 50 cents. She got a GREAT DEAL! 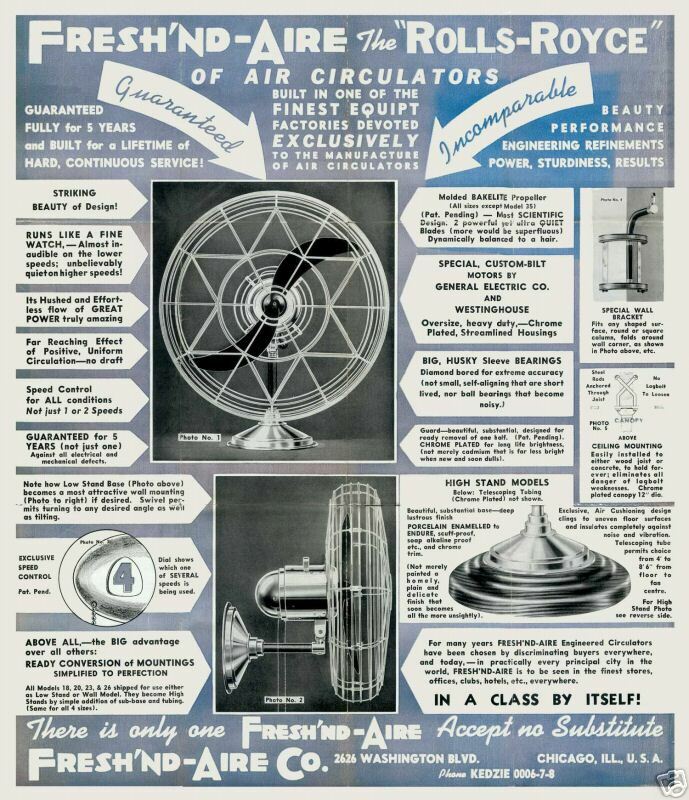 A lot of this stuff got donated to "scrap drives" during WWII when aluminum was in demand for airplanes. This particular object is a fish poacher. Your Work Room Equipped for Better Cooking with less Work undated, 5x8, 16p, softbound, black/white, Super Maid Cook-Ware Content: The Aristocrat of Cooking Utensils, Chicago, IL, undated [possibly circa 1915 from the near ankle-length dress the cook is wearing], promotional booklet issued by the Super Maid Cook-Ware Corp. 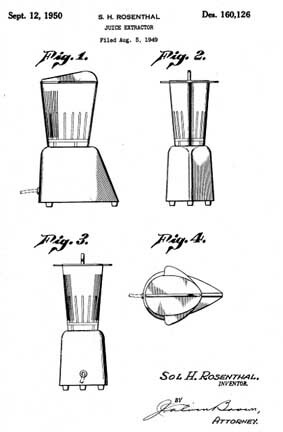 The "Super-Aluminum" that is imported from Switzerland that is used to make pots, pans, tea kettles, coffee pots, roasters, griddles, waffles, omelet pans, etc, includes recipes with illustrations showing the cookware in use. We have had some folks write to us claiming that Super-Maid cookware was made in Switzerland. Thanks to our very kind reader Janice, we have obtained the following excerpt from a Super-Maid brochure and it is quite clear that these utensils were made in Chicago. 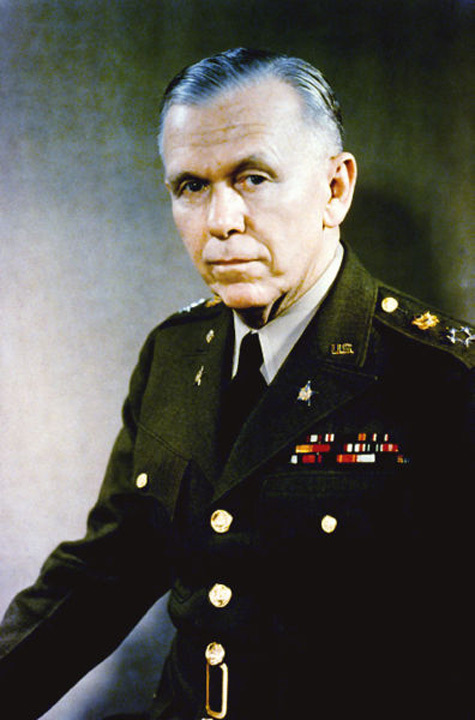 George Catlett Marshall (December 31, 1880 - October 16, 1959) was an American military leader, Chief of Staff of the Army, Secretary of State, and the third Secretary of Defense. Once noted as the "organizer of victory" by Winston Churchill for his leadership of the Allied victory in World War II, Marshall served as the U.S. Army Chief of Staff during the war and as the chief military adviser to President Franklin D. Roosevelt. He served as Presidnt Truman's special emissary to mediate the conflict between the Communist and Nationalist forces in China. As Secretary of State his name was given to the Marshall Plan, for which he was awarded the Nobel Peace Prize in 1953. General Marshall is on most historians' short list of the Greatest Americans Ever. 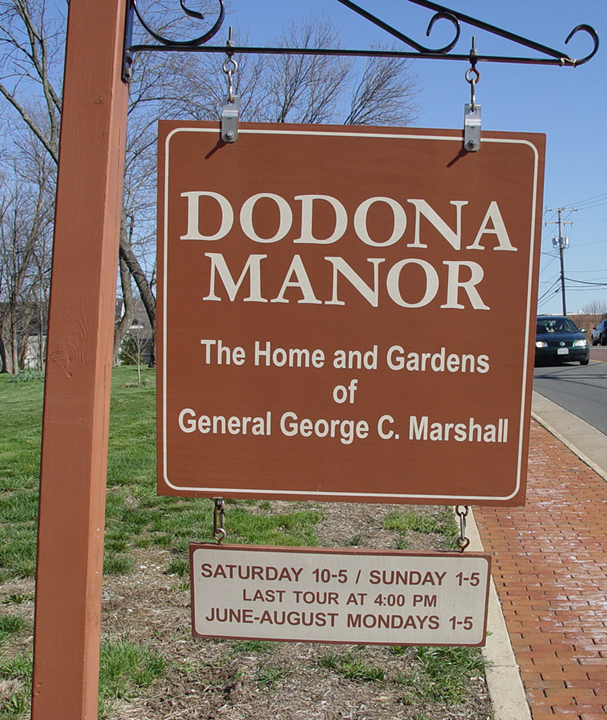 From 1941 - 1959, General Marshall and his wife lived at Dodona Manor in Leesburg, Virginia. 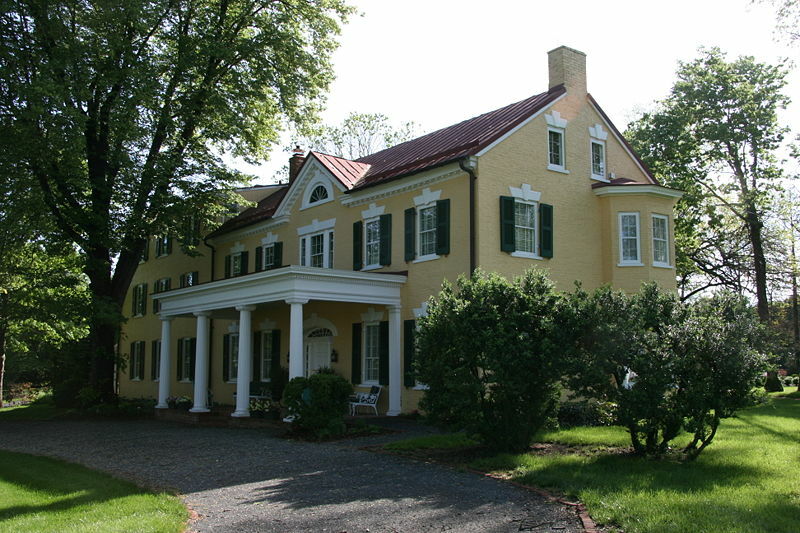 The house was constructed in the mid-1820s for John Dirsh. The house soon passed into the possession of the Ball family, who added an addition. There is evidence that the building served as a female boarding school in the 1850s. 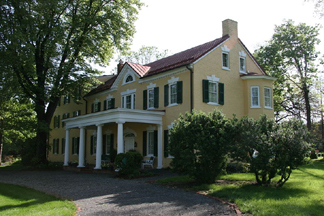 The Marshalls bought the house in 1941 and lived there until 1959. 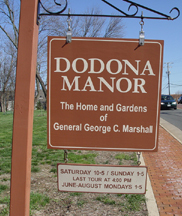 It was declared a National Historic Landmark in 1996 and is open for tours. General Marshall had some interesting high quality items in his kitchen, probably the best that American industry could supply. As discussed below, TODAY most of these prodcts are not made in the US and many of them have serious quality problems today due to lax standards in the foreign dictatorships where they are now produced by virtual slave labor. We remember that the intent of the Marshall Plan was to feed the hungry and move them to democratic self-government. Most likely, the General would be repelled by the insidious "International" financial shenannigans that effectively subsidize authoritarian regimes. In turn, this perverse 21st Century "Globalism" has resulted in the destruction of American manufacturing by the infusion of cheap and shoddy goods that cannot possibly be produced by workers earning a decent, living wage. Pyrex is a brand name for glassware that was introduced by Corning in 1915. Originally, Pyrex was made from thermal shock resistant borosilicate glass. 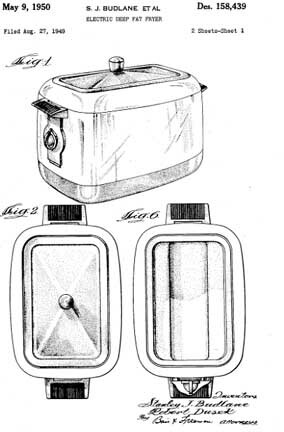 Durable and attractive, the new bakeware was soon produced in many shapes with various uses and became so popular that by 1919 more than 4 1/2 million pieces of PYREX bakeware had been sold. For that time in history, the numbers were staggering, especially considering that during the first few years of PYREX glassware's existence, America was deeply involved in World War I. By 1927, it was estimated that 30 million pieces of PYREX bakeware were in American homes. It is currently estimated that more than 75% of US Households have at least one Pyrex item. 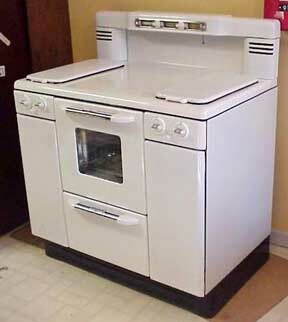 In 1998, Corning sold its consumer products division which subsequently adopted the name World Kitchen. Pyrex kitchen glassware manufactured and licensed for sale in the United States, is now made of tempered soda lime glass at the World Kitchen facility in Charleroi, Pennsylvania. (Once you hear the word "World" you should think "Cheap and Cheesy." ) Numerous complaints have been received by the Consumer product Safety Council that these new products are vastly inferior to the older ones. The European Union insists on the old standard and all Pyrex manufactured in Europe follows the 1915 formula for borosillicate glass. At the risk of those American jobs in Pennsylvania, we urge you to insist on either Eurpean Standard Pyrex or to buy vintage pieces. There are 3 basic types of collectible Pyrex: Clear Pyrex Ovenware (introduced in 1915), Pyrex Flameware (1936 - 1979) and Pyrex Colors (1947 - ?). Of the three types, most people are familiar with the Colored Pyrexware because it is very distinct and there is a considerable amount of it still being used in households. There is a good chance that any antique store or flea market you visit will have a number of Pyrex items for sale. 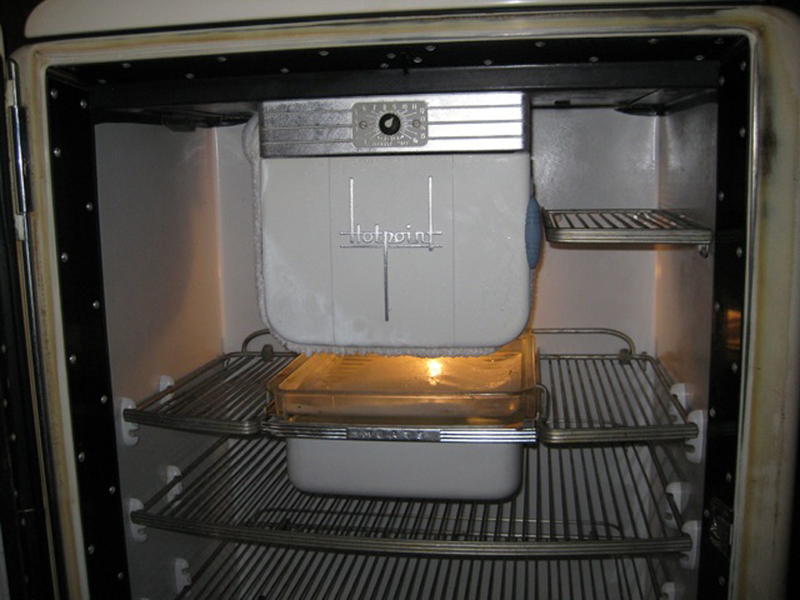 Please consult the Pyrex Love wensite for much more information about collecting Pyrex. Revere Ware Corporation began as a division of Revere Copper & Brass, a metal company based in New York that was formed in 1928 from a merger of six small metalworking companies. One of the six firms in the 1928 merger traced its roots back to the famed American revolutionary and silversmith Paul Revere. This company, Taunton-New Bedford Copper Company, had bought the assets of Paul Revere and Son in 1801. Another company in the 1928 merger, the Rome Manufacturing Company, also had a lengthy history. 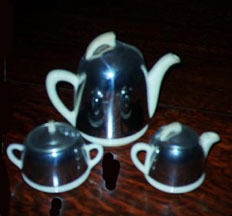 It had manufactured tea kettles and other housewares since 1892. But the principal products of Revere Copper & Brass were industrial, not housewares. The company manufactured copper pipes, bars, tubes, and sheets. Soon after its inception it was one of the largest copper manufacturers in the United States. The famous cookware line was developed in the 1930s, as the company was seeking to diversify away from strictly industrial products. At a time when most cooking was done in heavy cast-iron pots, researchers at the company attempted to make a lighter weight, easier to clean pot out of copper. The first Revere pots were copper with a chrome-plated inner lining. But this metal combination did not work well. Though copper was an excellent heat conductor and light weight, the chrome lining was easily scarred by acidic foods. Concentrated research at Revere led to a new combination. 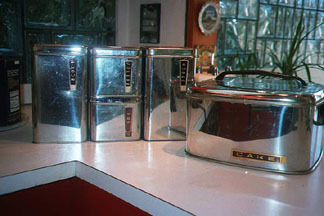 The new pots were made of stainless steel, a light, durable, smooth, stain- and scratch-resistant metal. 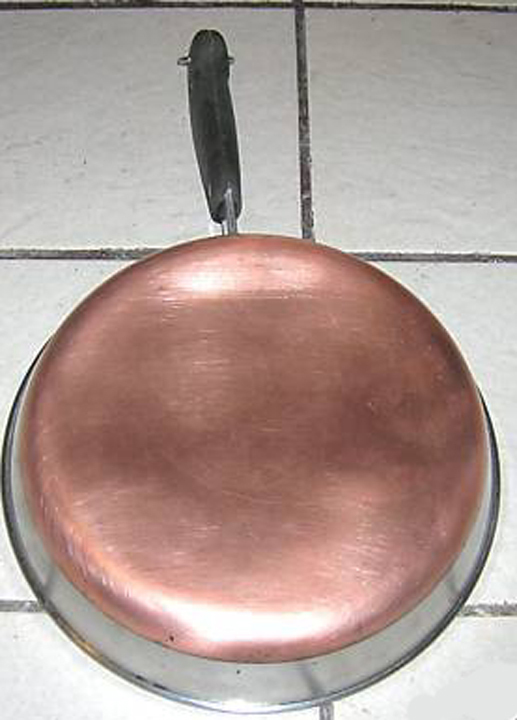 The company electro-plated copper to the bottom of the pot, to give great heat conductivity. 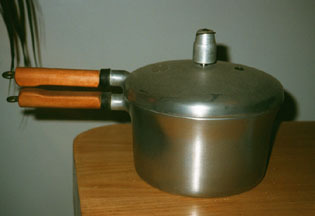 The pot handle was made of Bakelite, an industry first. 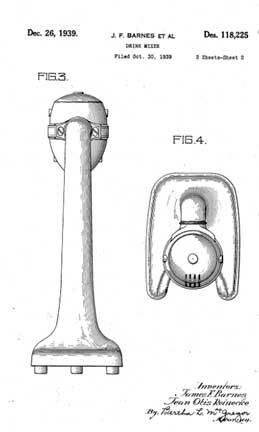 The design of the handle was based on a silversmith's hammer, and its curved knob was echoed in the rounded inner surface of the pot. 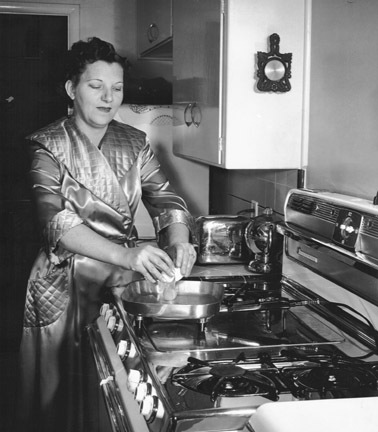 Revere Ware, in development since 1932, debuted in 1939 at the Chicago Housewares Show. It was an instant hit, and this brand of cookware soon became the most profitable division of Revere Copper & Brass. Revere Ware was a staple of the American kitchen throughout the 1950s. Eventually, the Revere company tried to get into the aluminum business and got into financial trouble. As usual, "financiers" looted the company over and over again. 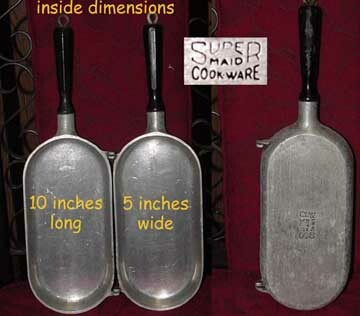 The "remains" still sell products under the "Revere Ware" name, but they have an inferior copper coating and they are made in Indonesia and China. (So what else is new...) The Amazon reader blogs are full of complaints about the "Cheap and Cheesy" nature of these products. You are advised to buy vintage -- they were indestructible in 1955, why should they be any less indestructible today? If you have "qualms" about using "someone else's cookware", then you should (a) never eat in a restaurant and (b) avoid antique silver like the plague. Your "qualms" are money in the bank to the Chinese Dictatorship. The A.F. 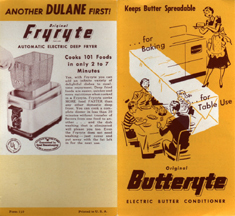 Dormeyer Corporation evolved from the former MacLeod Manufacturing Corporation. 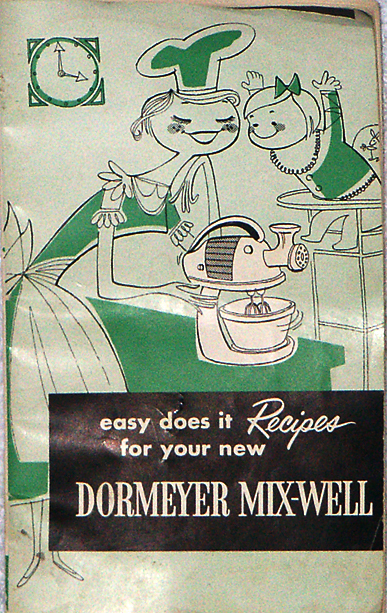 Dormeyer was almost as familiar an American kitchen presence as Sunbeam, made by Hamilton-Beach. 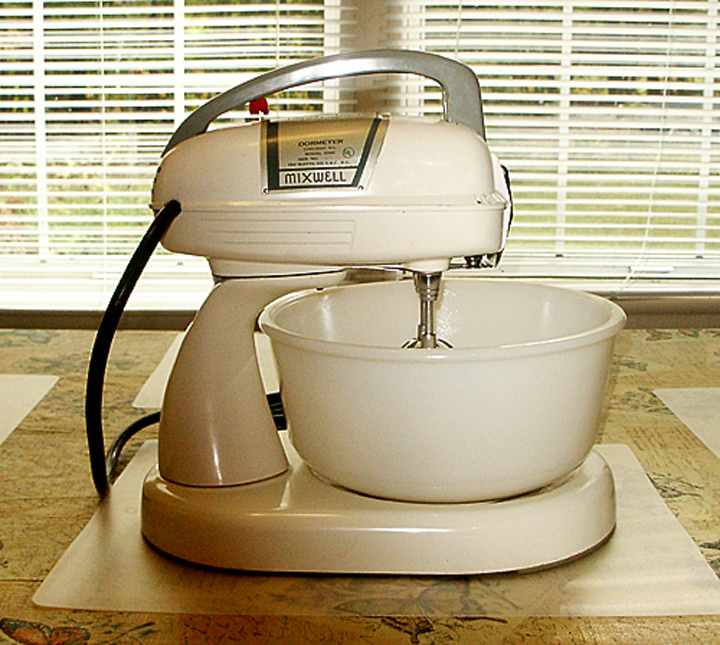 (Their earliest products included a hand-held electric beater with a Hamilton Beach-made motor!) 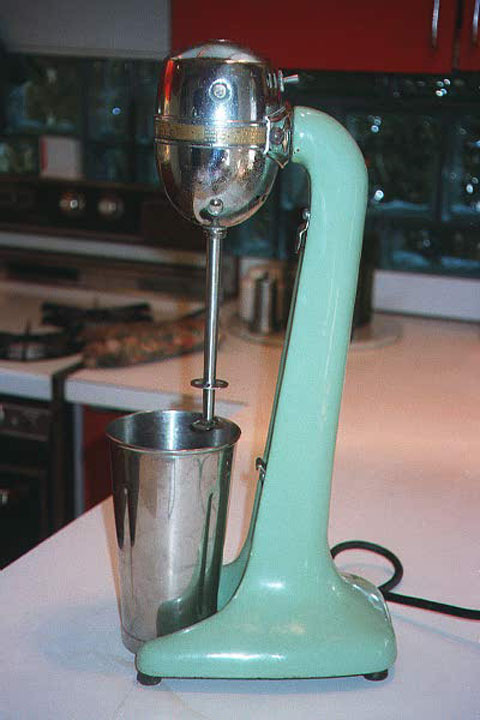 In the 1920s, they introduced a memorable, box-like hand-held mixer with a beater assembly designed to allow the mixer to stand freely in a bowl. Their first big "hit" was the Mix Rite, with an overall shapely design. 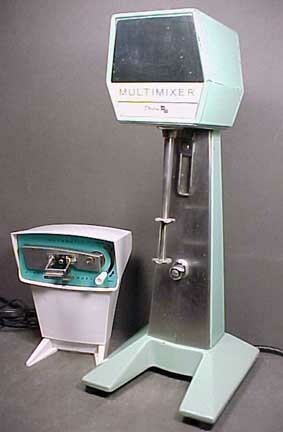 In later years, Dormeyer almost equaled the Mixmaster's popularity and identifiability. 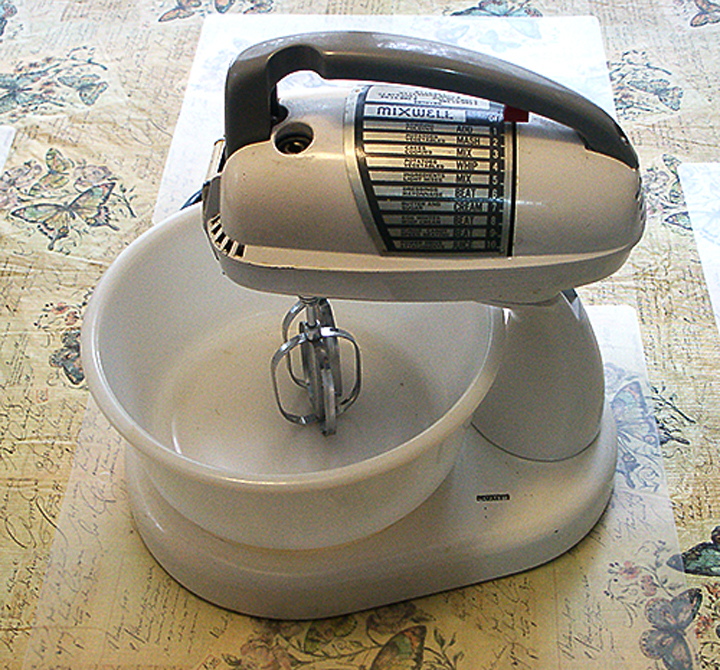 The Power Chef and its chrome variants, the Silver Chef and the Silver Star were almost as familiar in American home kitchens as the Mixmaster, as detailed on our separate page on Kitchen Mixers. 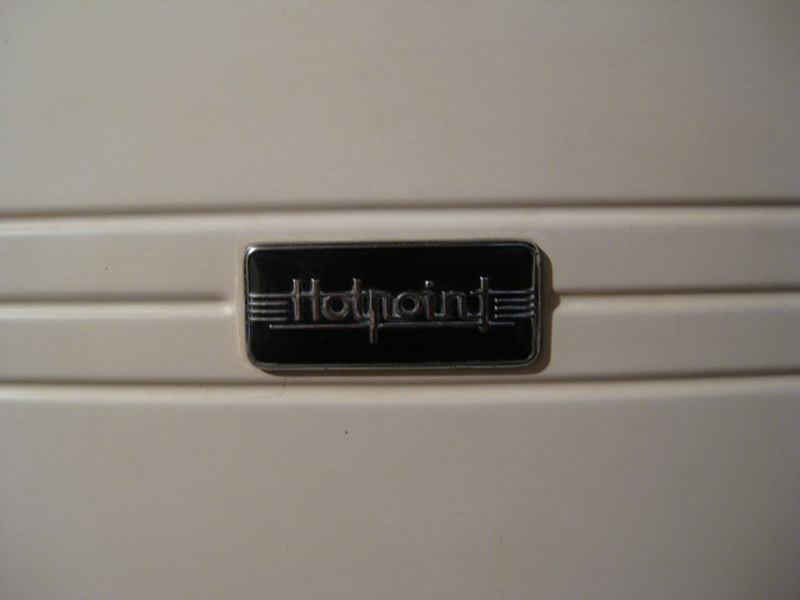 Dormeyer appliances were as durable as their Sunbeam rivals. 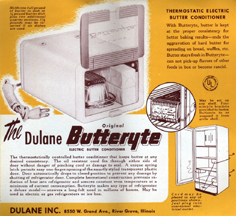 The typical Dormeyer appliance as a stodgy-looking product that usually appeared dated before its first year's life was done. Perhaps an inability to reconcile affordability (the topline Dormeyer mixer was priced typically higher than the Mixmaster and other such competitors) to top quality construction, with less room for style appeal, combined to price Dormeyer right out of its markets. By 1967-68, approximately, the was out of business. For a company that built its own loyal customers, this seems shameful at minimum. That loyalty remains as Dormeyer buffs swap the company's own vintage products. 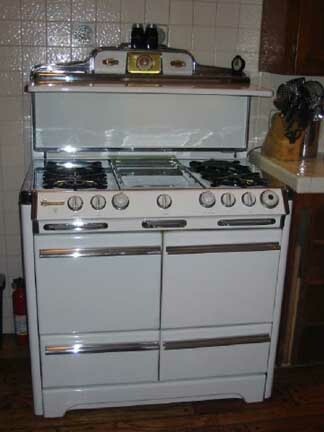 Please consult Jeff Kallman's Encyclopedic Mixer Site for photos of more Dormeyer appliances. 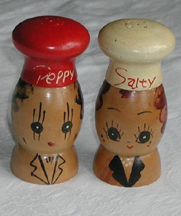 On the top of the range is a pair of "Salty and Peppy" shakers. 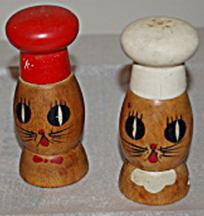 This was a 1940s fad - hand painted (in Occupied Japan) wooden salt and pepper shakers in the form of cats dressed as chefs. The toque (hat) screws off, although some had cork plugs in the bottom. The decoration of the faces, including the eyes, noses, whiskers and mouths, were hand-painted. Considerable variation is seen ammong pieces -- no two are the same. In the expensive models sold in upscale gift shops, there was a noisemaker in the bottom that made a sound like a cat. They were considered to be just terribly cute and ideal for gifting. Soon, almost every upper-middle class home had Salty and Peppy. 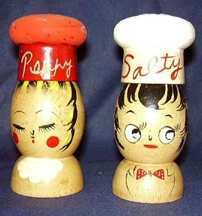 The subject matter was always a male and female, and in later knockoffs, the figures became more human than cats. The Japanese have this fascination with immense eyes, so whatever the species or gender, the things alwayas had giant peepers. The Jadeite Tumbler was actually inserted into the Soap Package! Restaurants served meals on jadite dishes, as they cost pennies to buy and had a high threshold for breakage. 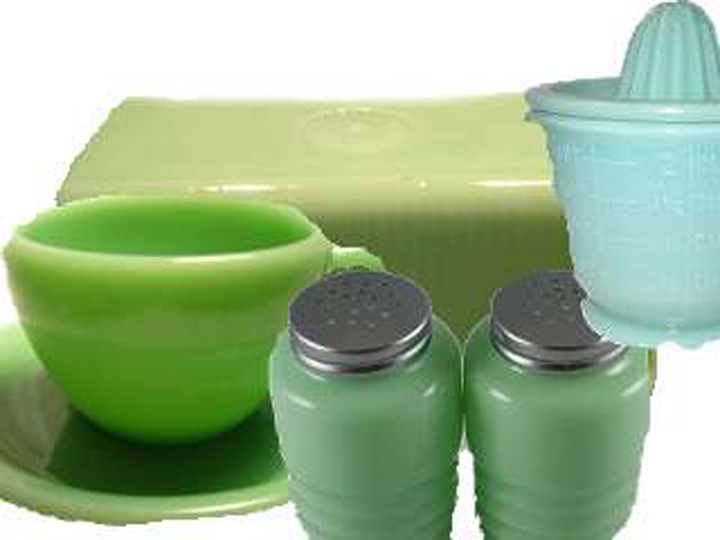 By far the largest and most well-known producer of jadite was the Anchor Hocking Glass Company that developed jadeite glass ovenware that could endure high oven temperatures. 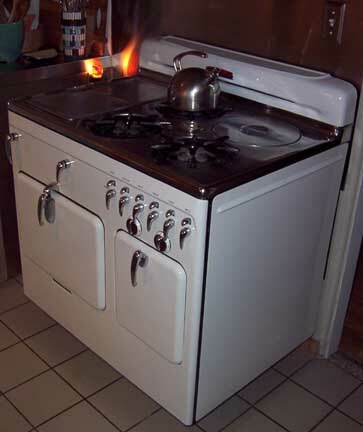 Their Fire-King ovenproof glass debuted in 1942 and was made for 30 years. The opaque green color "Jade-ite" was the most popular Fire King color. 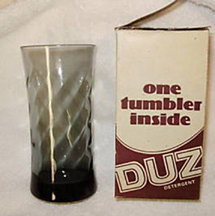 There is virtually no end to the list of items that were made of this glass. Of note, General Marshall's kitchen has a Range Set of green jadeite glass. 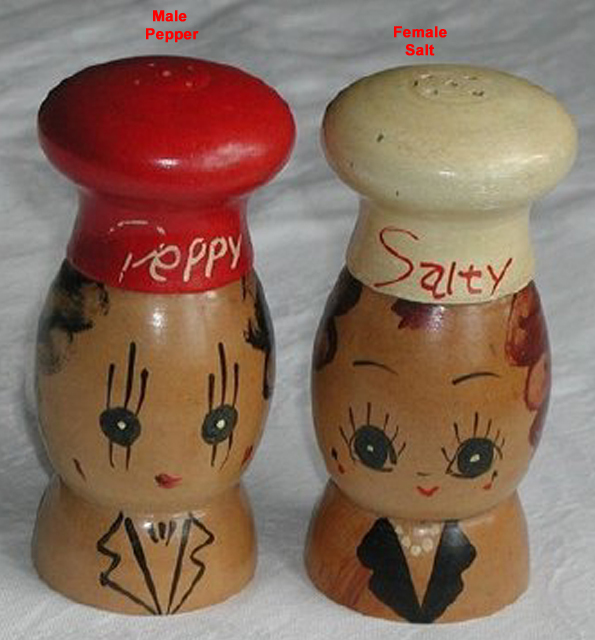 This means a matched set of four shakers: Salt, Pepper, Flour and Sugar. On the stove is a tin of Maxwell House Coffee, named in honor of the Maxwell House Hotel in Nashville, Tennesee. For many years until the late 1980s it was the largest-selling coffee in the U.S. For the longest time, the company's slogan was "Good to the Last Drop", supposedly a tribute paid by Teddy Roosevelt. During the 1950s, Maxwell House sponsored the I Remember Mama television program that always ended with a happy family drinking coffee. Thanks to our friend Stuart in Vermont, here are some links to episodes from that show, and you can watch the family solve each others problems and then reminisce over a good cup of Joe. Junket: To a good many children growing up in the 1930s through the 50s Junket was as much a part of supper as listening to the Shadow and Jack Benny on Sunday nights. The product's full name, Junket Rennet Custard -- is a powdery dessert mix containing the rennet enzyme which, when mixed with warm milk, causes the milk to curdle and produce a custardlike dessert. The Junket mixes evolved from the Chris Hansen Laboratories of Denmark, which began producing rennet products for use in the cheese industry in upstate New York in the 1870's. The Salada division of Redco Foods still manufactures these products at the original site, an island in the middle of the picturesque Mohawk River. Minute Tapioca Pudding The "old fashioned way" to cook tapioca took hours -- and resulted in blobs of tapioca that were uneven. Kraft Foods changed all this when it introduced an "instant" version that used pearl tapioca -- it cooked in minutes and had a smooth, even consistency. Kraft still makes this product today. Ann Page Products "Ann Page" was the A&P house brand for canned goods and spices. (Get it? A&P, Ann Page) In the 1950s, amorous Engineering students (like me) might want to make intellectual conversation with refined young ladies from finishing schools. Sometimes I discovered that there were those who feigned more erudition than they actually had. As a test, I would include Ann Page as one of the Wives of Henry VIII. The brand for A&P baked goods was "Jane Parker" and a similar ploy would list her as the author of "Pride and Prejudice". Here is a view of the opposite side of General Marshall's kitchen, identifying some of the appliances and products shown there. You can enlarge the picture to read the titles and see the appliances more clearly. 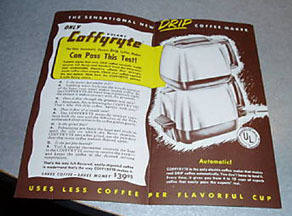 The West Bend "Kwik-Drip" Coffeee Maker is discussed on our Coffee Paraphernalia page. 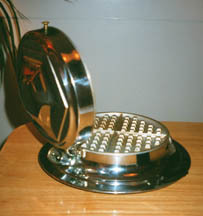 The Sunbeam Waffle Iron may be found on our Waffles page. 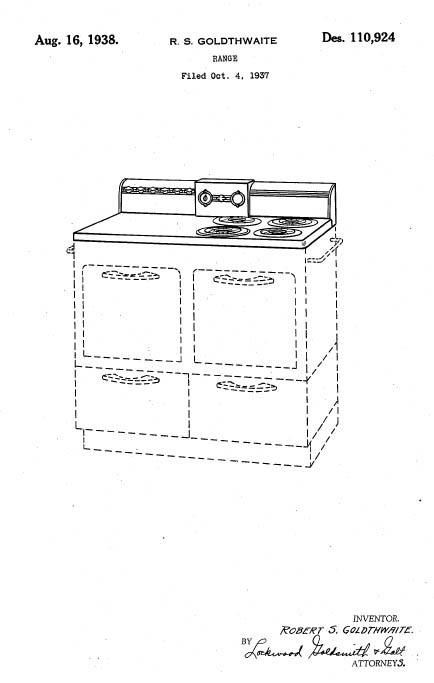 Starting in the 1930s, he Rival Corporation of Kansas City, MO produced a large line of of kitchen appliances that were supposed to do things "automatically" -- and all of them ended with "O-Mat." 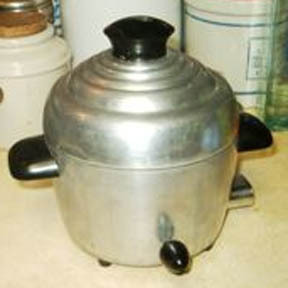 ("Can-O-Mat", "Juice-O-Mat", "Broil-O-Mat", etc) The company is still in the small appliance business, but production of the "O-Mat" series ceased sometime in the 1960s; today, the company is known for the Rival Crockpot ceramic slow cooker. The first Juice-O-Mat and Ice-O-Mats entered the marketplace around 1936. The early models reflected the clean lines, glistening chrome and art-deco style of the times. Many models can still be found with their baked enamel finishes intact, showing little sign of age. 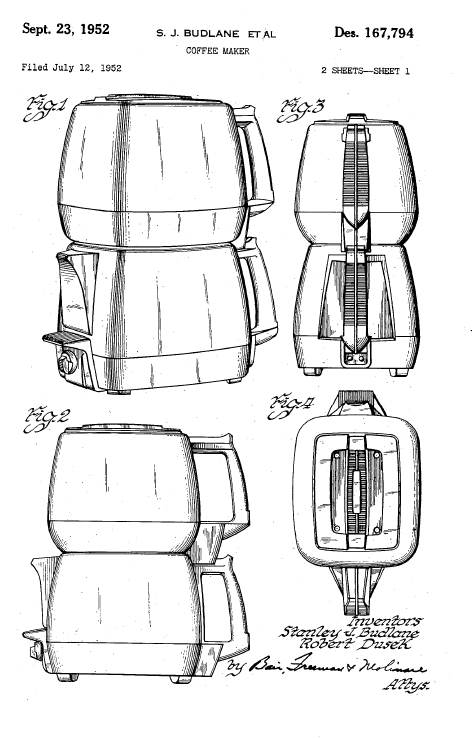 The first models were free-standing, but the company designed custom wall-mounts on many of its products beginning in the late 1940s. 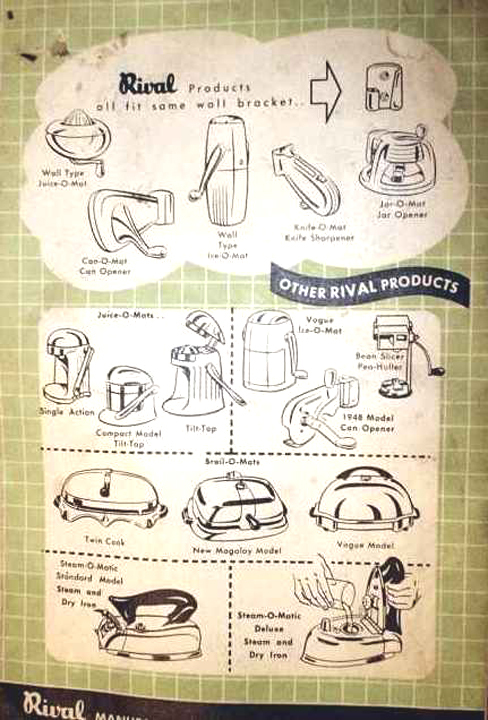 Rival eventually expanded the line of appliances to include can openers, vegetable shredders, meat grinders, and new design innovations throughout the life of the products. The colors and styling were always a reflection of the times, and can easily be identified by decade - the strong art-deco lines and muted colors of the 30s and 40s; the soft edges and smooth curves with bright pink, tourquise, copper and chrome finishes of the 50s; and the less aesthetic boxy 60s models in the [for that period] classic Almond and Avocado colors. 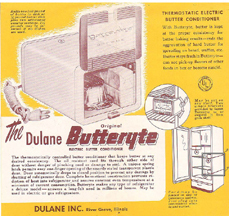 In the 1950s the company also began producing electric models, the first of which was simply called the Electr-O-Matic - an electric counter-top meat slicer that would scare the most battle-hardened OSHA inspector. 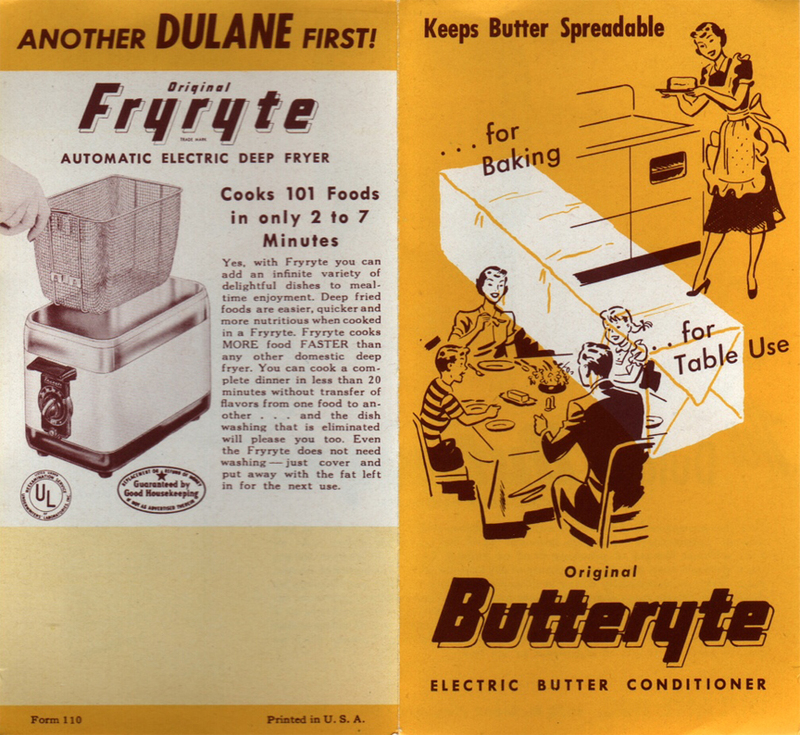 There were also waffle irons and other electric utensils, but these are quite rare. When a pocketbook manufacturing company burned down in 1911, many residents of West Bend, Wisconsin, were thrown out of work. Young Bernhardt C. Ziegler, a local entrepreneurial dynamo who had organized his own full-fledged fire-insurance company while still in high school, set out to find a substitute industry for the townspeople. 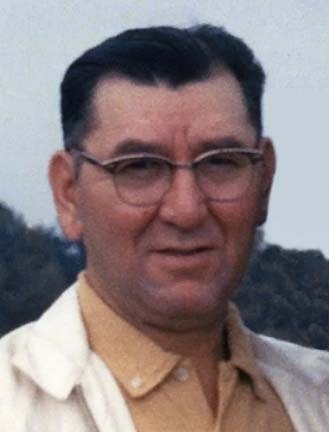 Impressed by the growth of aluminum novelty and cookware companies in eastern Wisconsin, he recruited six other men who, with himself, each put down $1,000 to incorporate the West Bend Aluminum Co. on September 27, 1911. Five of the seven founders were businessmen. The other two, Carl and Bob Wentorf, were skilled tool-and-die makers who had been working for an aluminum cookware company but had been threatened with dismissal because a third brother had left the firm to join another Wisconsin aluminum cookware company. They immediately began work on the tools and dies needed by West Bend. The founders rented an old button factory on the west bank of the Milwaukee River for $8.50 a month and three weeks later had a lathe, shaper, and drill press in place. A draw press capable of turning out about 15 kinds of utensils was ordered from Brooklyn, New York, and 3,000 pounds of aluminum from a firm in Pennsylvania. Six to ten men were employed in the factory initially. 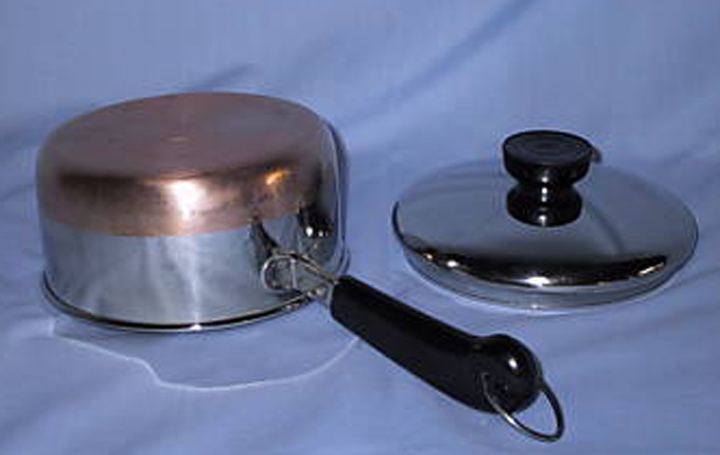 The first items to bear the West Bend name were saucepans in four sizes, a frying pan, a pie pan, and a water dipper. 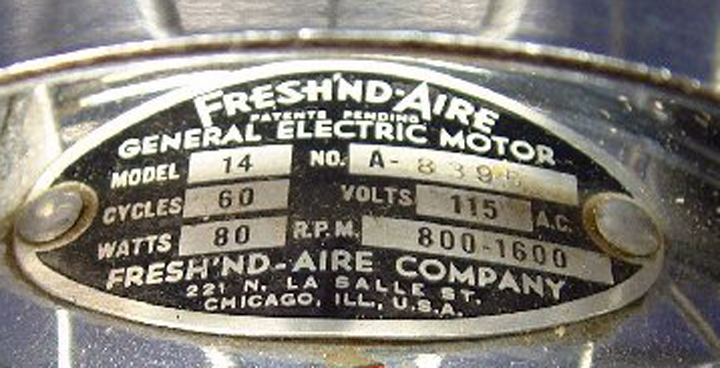 The company first exhibited its products at a 1913 hardware association meeting in Milwaukee. West Bend's anchor customer during these early years was Sears, Roebuck and Co., which until 1926 was wholly a mail-order firm. Up through 1919 Sears purchased between 40 and 50 percent of the company's production. Most of the rest was sold to different jobbers under their brand names. During World War I, West Bend won a contract to produce army mess kits, but just as production began, the war ended. After the war West Bend introduced its line in department stores, but the market was dominated by two bigger companies. 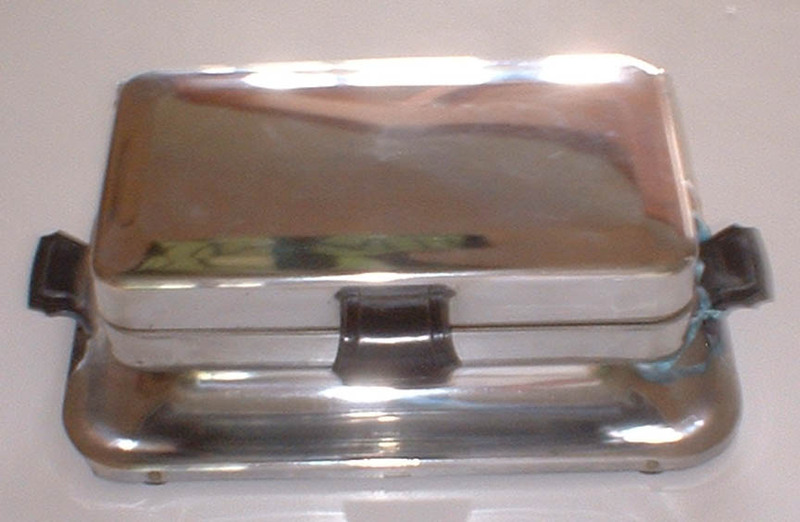 By 1929 West Bend ranked third in the nation in sales of aluminum cookware. 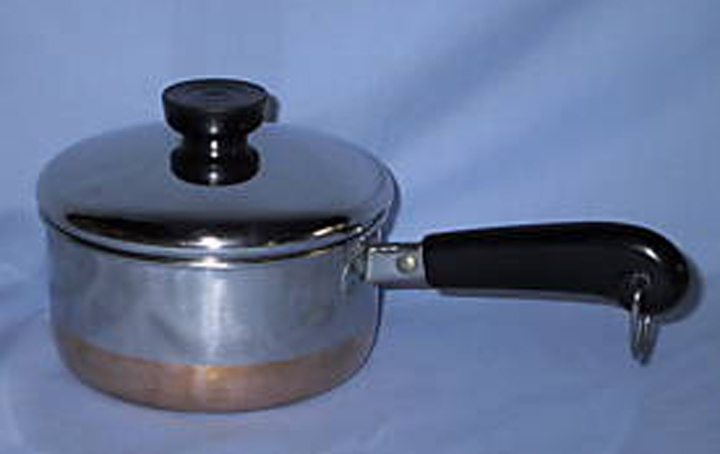 In 1932 it introduced a "Flavo-Seal" line of heavy-gauge cookware made of up roasters, saucepans, and skillets and designed, like the Waterless Cooker, to cook foods without adding water. 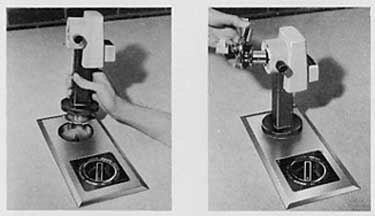 Two years later the company began to sell the Flavo-Seal line through retail stores as well as commissioned salesmen. 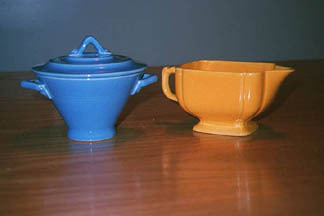 These utensils were successful, and a new three-story addition had to be added to the factory in 1937 to handle increased demand. In 1941, as the United States was being drawn into World War II, aluminum was earmarked for military production only, threatening West Bend's production. However, West Bend won a naval contract to produce 20mm brass antiaircraft cartridge cases. During the war the company produced more than 300 different items under defense contracts, including powder tanks and rocket containers. By the end of the war it had earned six Navy "E" awards for outstanding achievement. During the war West Bend executives purchased the Kissel automobile plant in nearby Hartford, Wisconsin. After the war the plant was converted from military production to the manufacture of the first air-cooled outboard motor. 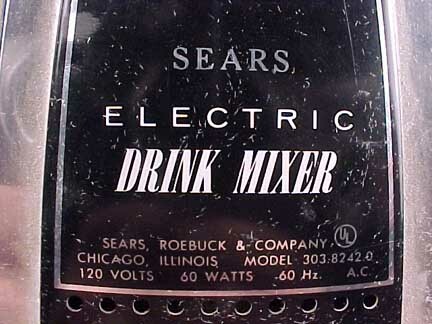 It was sold, beginning in 1947, exclusively through Sears under the "Elgin" name and by West Bend under the "West Bend" and "Shark" names. A factory was added in Barrie, Ontario, in 1957 for Canadian distribution. Chrysler Corp. bought West Bend's outboard-motor and industrial-engine division in 1965 for an undisclosed sum. West Bend of Canada then became strictly a distribution center for the company's Canadian sales rather than a production facility. Meanwhile, the West Bend plant also returned to civilian production and resumed its refinement and development of home appliances. 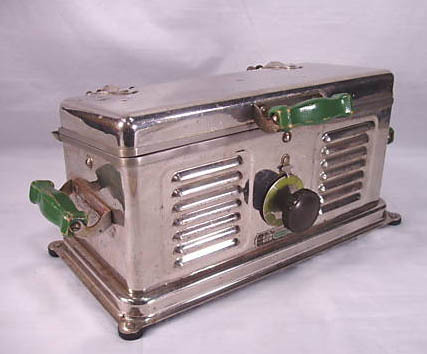 It developed a color finishing process for aluminum and introduced new products like popcorn poppers. However, when the Korean War broke out in 1950, aluminum, as well as copper and steel, again became a restricted material. 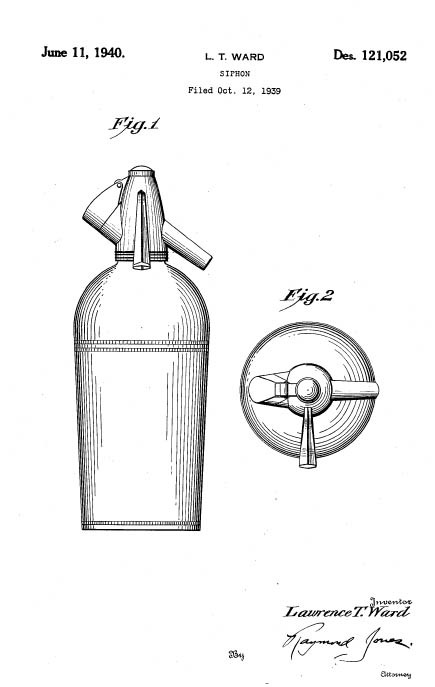 Although West Bend continued limited manufacture of products for civilian consumption, it also produced such military items as cartridge cases, powder tanks, rocket containers, and gas-mask canisters. After the war ended in 1953, West Bend continued defense production, notably with an army contract to make ammunition. In 1961 it dropped "Aluminum" from its name to reflect its use of a variety of materials, such as plastics, copper, steel, and brass. 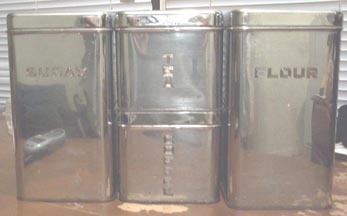 This Canister set was most likely made in the period 1945-1952. 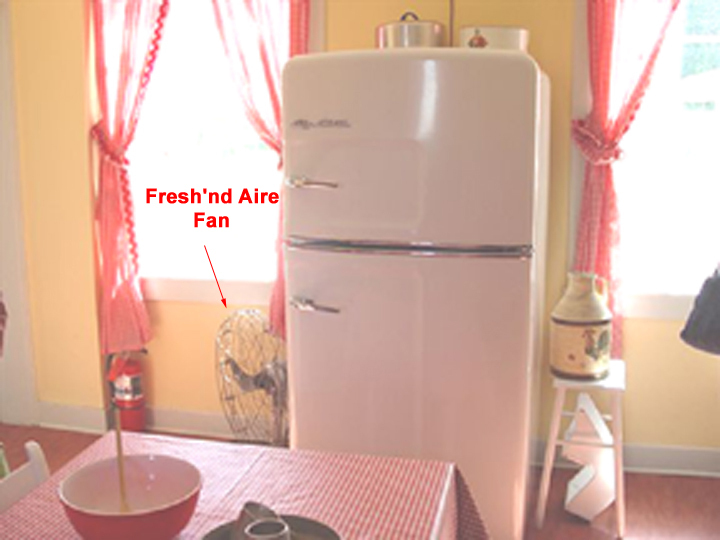 Here is a view of the third wall of General Marshall's kitchen, showing the refrigerator and a floor fan. 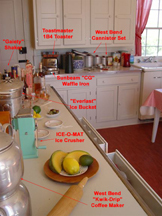 You can enlarge the picture to read the titles and see the appliances more clearly. The first thing to note is the refrigerator -- it is BRAND NEW. 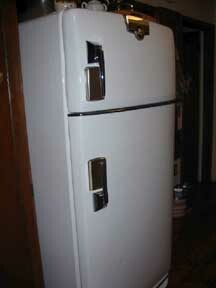 This is part of a line of refrigerators, stoves and dishwashers in the 1950s style with 2009 energy efficiency. You can check them out at: bigchillfridge.com. 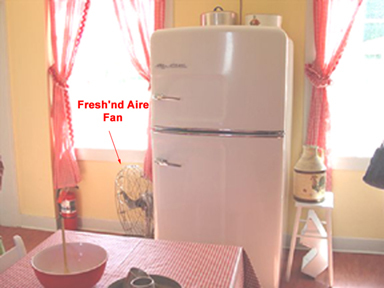 To the left of the fridge is a Fresh'nd Aire two-bladed fan. 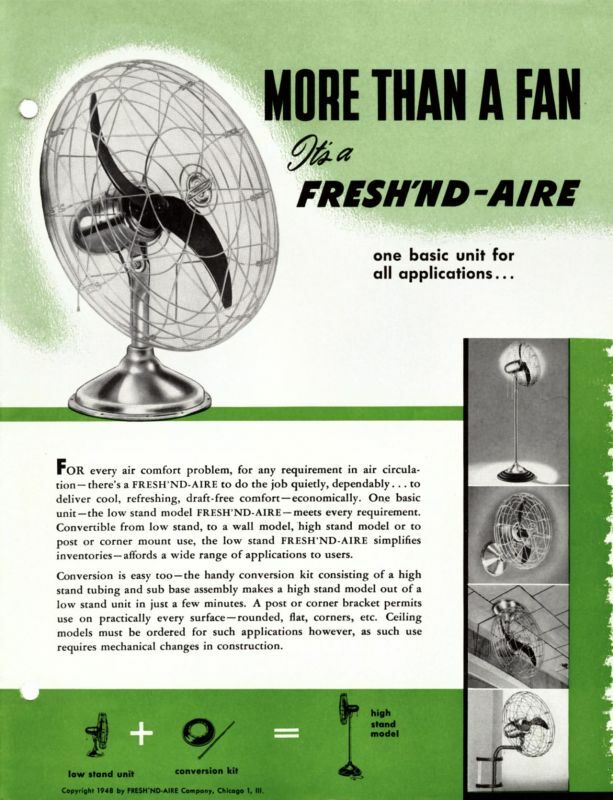 These were quite "high-tech" for the 1950s, and quite expensive. We got very lucky at an estate sale -- we found a box in an attic with a large number of appliances that had NEVER BEEN USED! The house had been owned by people who obviously knew quality. Our guess is that these were gifts of one sort or another that never quite got used, sort of like those fruitcakes, wine chillers, or exotic tea assortments that come from distant but well-meaning business associates. There is nothing actually wrong with them, but they get put in the back of the closet and forgotten. 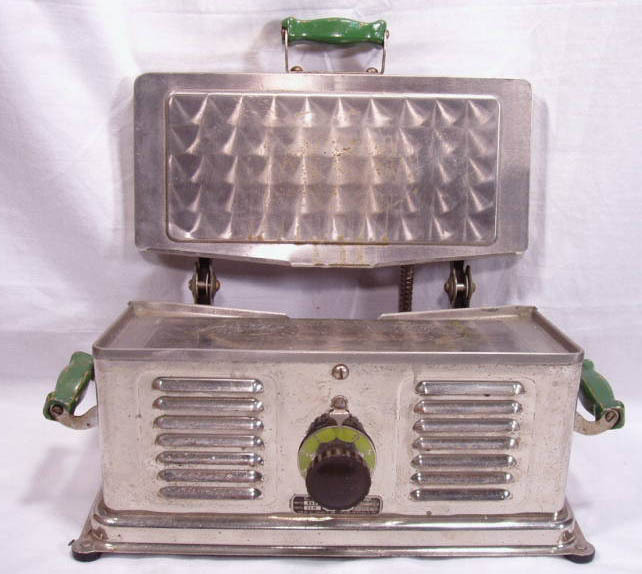 We were particularly impressed with this "REX-RAY" sandwich grill that had been purchased in a Rexall Drugstore. 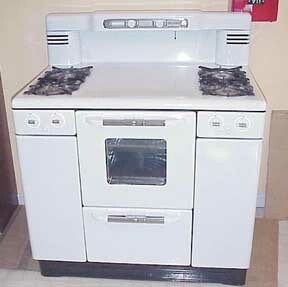 This is a copy of a Manning-Bowman appliance, but in every respect, it is lighter, less flexible and more cheaply made. 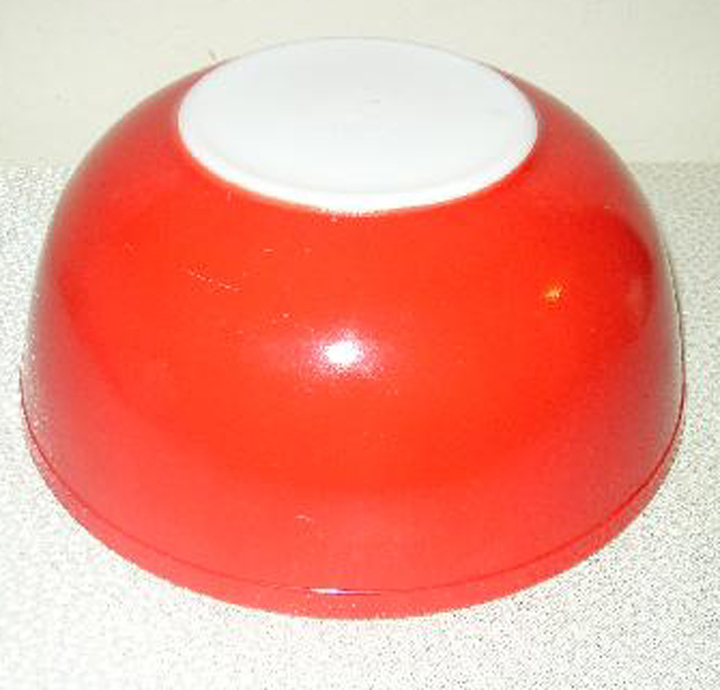 For example, the bakelite handles are only an eighth of an inch thick. The heating wires are spaced an inch apart, where they would be a fourth of an inch apart in a Sunbeam appliance. Everything has been made just a bit lighter so that it could be sold cheaper. 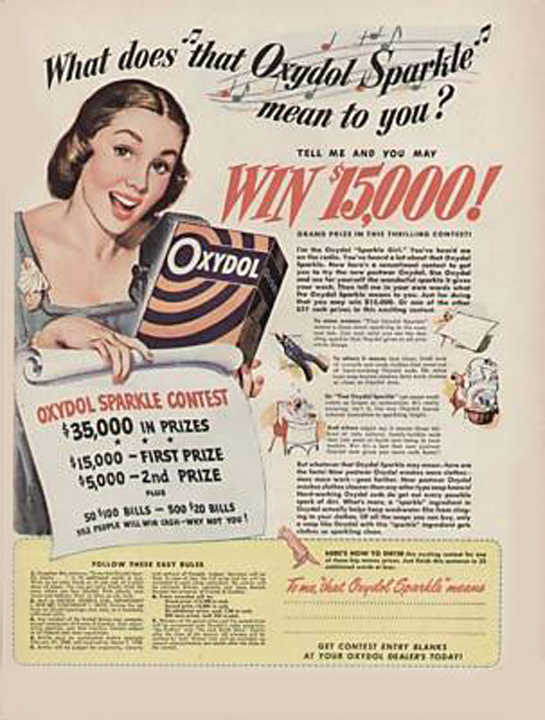 In the 1930s, drugstores were the equivalent of today's discount stores. 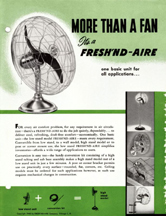 On our Fan Page, we discuss the so-called "Drugstore Fans" that are collectible because not many of them survived the test of time... So it is for other electrical appliances. We were fortunate to find this with its original sales tag still attached. 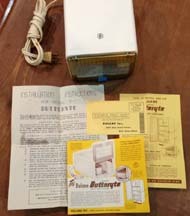 The tag says that this is the "Rex-Ray Grill and Sandwich Toaster Model X126" --- in fact, this is a Fostoria Sandwich Grill made by the Bersted Manufacturing Company of Fostoria, Ohio. It is their Model 350, and draws 500 Watts at 115 Volts. We note that the Rexall guarantee requires you to return the object to the "Rex Ray Service Station" (no street address given...) in of all places, Fostoria, Ohio. This object cost $7.25 at your local Rexall Pharmacy. This cheesy and cheap object also stands as an object lesson. Let us move from the depths of Art Deco design to the Heights --- The Manning-Bowman Company was considered to be the "Cadillac" of marks, making products which found their way into the homes of the very wealthy to the more humble homes of the middle class. Whether is was a butler, maid, or homemaker who served guests in ware made by Manning-Bowman, the items were always well-designed and seemed to last forever. This of course can be a problem if you are trying to make consumer goods. Nevertheless, authentic Manning-Bowman products, especially those with the "M-B Means Best" logo are among the most prized deco artifacts. In 1941, Manning Bowman was sold to the Bersted Manufacturing Company of Fostoria, Ohio. Most of the well-known appliances designs for which the Manning-Bowman company were know before war now were moved to the Ohio location. The post-war period proved a difficult one for the company. 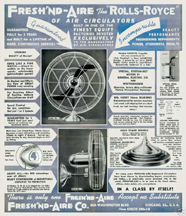 It tried to re-introduce wares for the American home, but as its designs had not changed much from its heyday in the Art Deco period, it met with limited consumer acceptance. What was left was the Drugstore market. By 1951, the company had closed. Our poor little drugstore grill is yet more evidence of the effect of corporate shennanigans on quality. You will see this theme repeated throughout these pages. Corporate takeovers result in low quality products and eventually the public catches on! 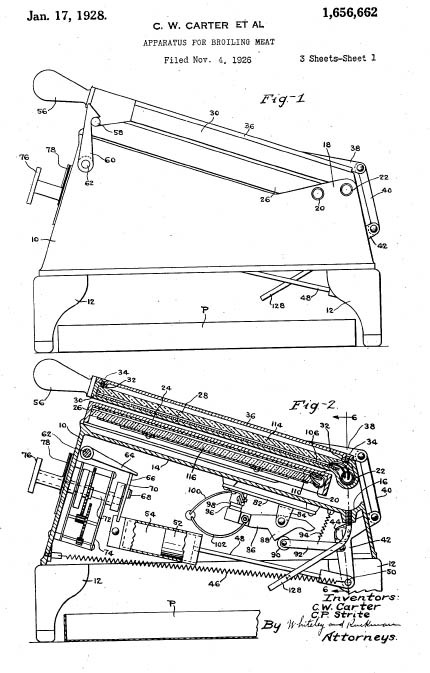 Here's the Patent Diagram for the original, done by David Chapman. 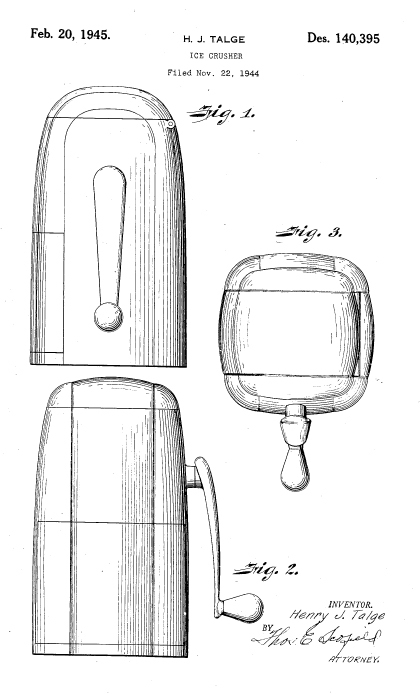 Note that the ornament has been removed and the handles are simplified in the Berstead knockoff. 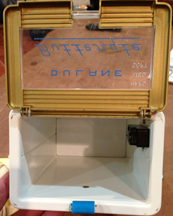 Click Here for a more detailed discussion of Manning-Bowman designs to contrast them with this drugstore artifact. "... here are some photos of a "muffin iron." It was made by Lewis Electric Manufacturing Company in Cleveland, Ohio. It is Model AT No. 427, operating at 525 watts. 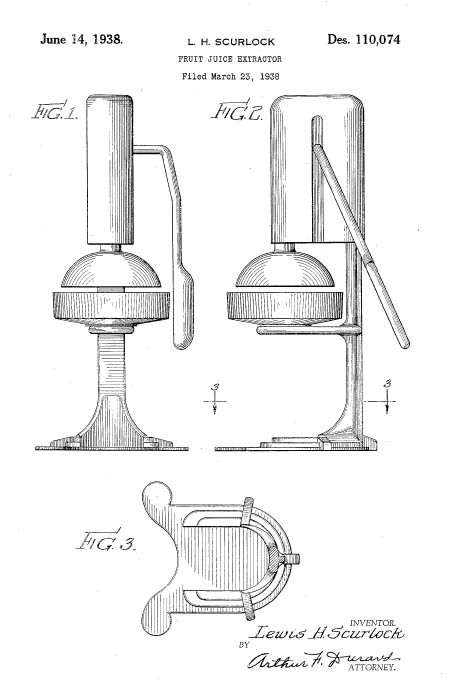 I can find nothing about the company or the device in William George's ANTIQUE WAFFLE IRONS book, which, of course, only deals with waffle irons. 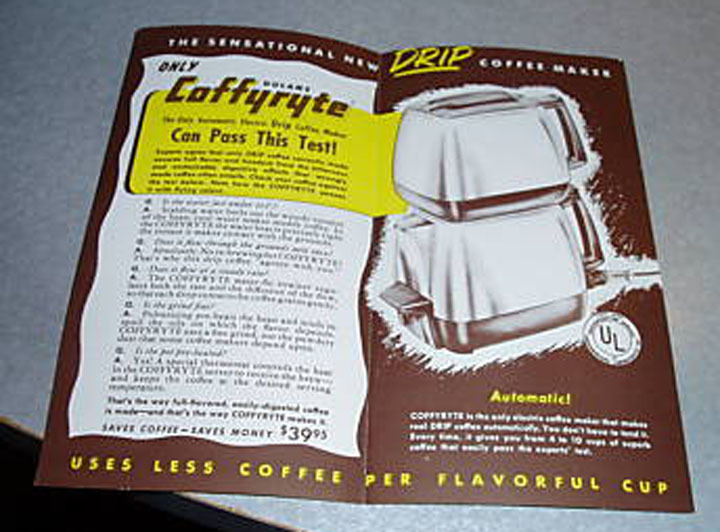 I believe that there are some contemporary devices on the market to make muffins, so this must be a long-lost ancestor. 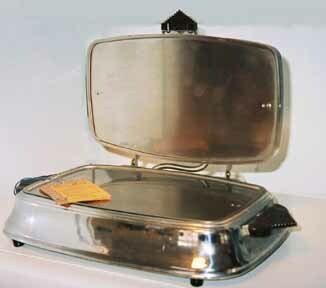 Hope that this device can add something unusual to your site..."
This is another sandwich grill made in the late 1920s by the C.W. Carter Company. 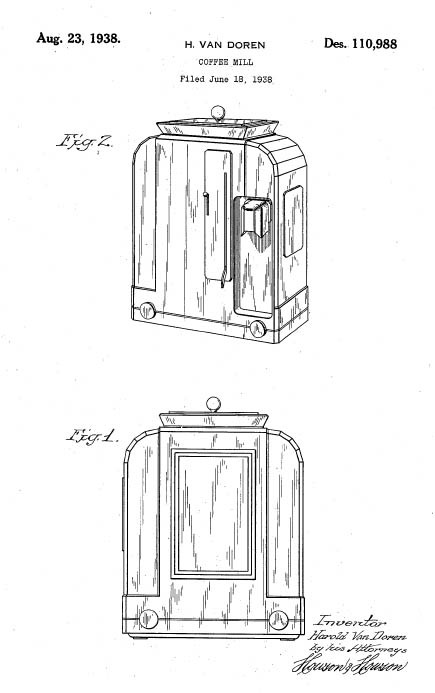 It evolved from a bacon cooker and has a sloping cook surface to allow fats to drain into a cup at the rear. This model has a thermostat. This is very similar to the George Foreman Grill sold extensively in the US since 1997. Both share the slanted cook surface. The Carter Grill could also prepare those ultra-fashionable pannini sandwiches of today. 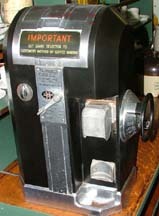 This is a large Hobart coffee grinder that once was used in an A&P store. 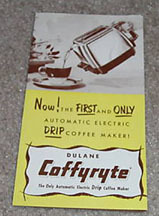 In older times, coffee was not packaged in vacuum packed bags. Rather, whole beans were sold and ground fresh at the market. 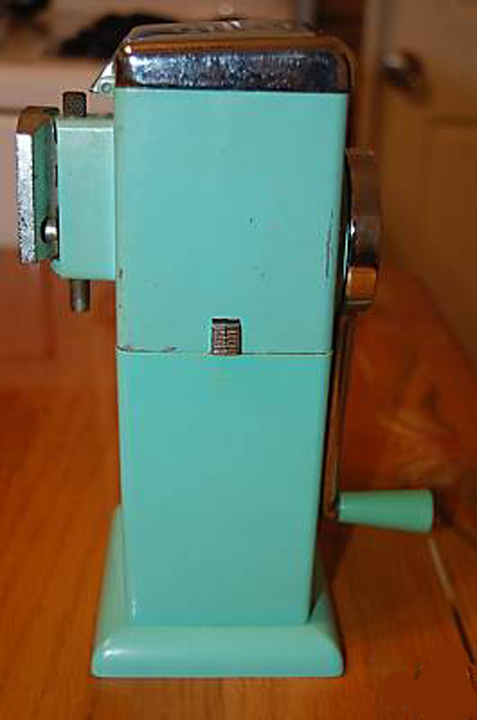 The Hobart grinder was always at the end of the checkout line (or at the cash register at Mom & Pop stores). 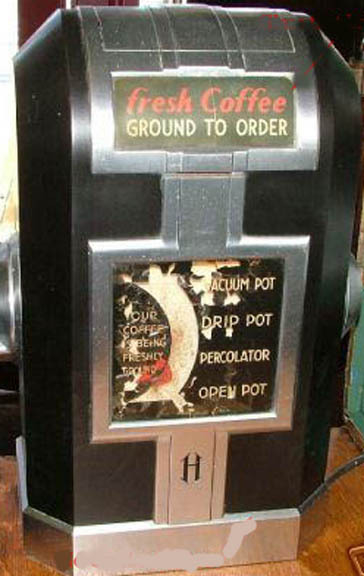 The checkout clerk would ask you how you wanted your coffee ground, set the dial and let the machine chug away. 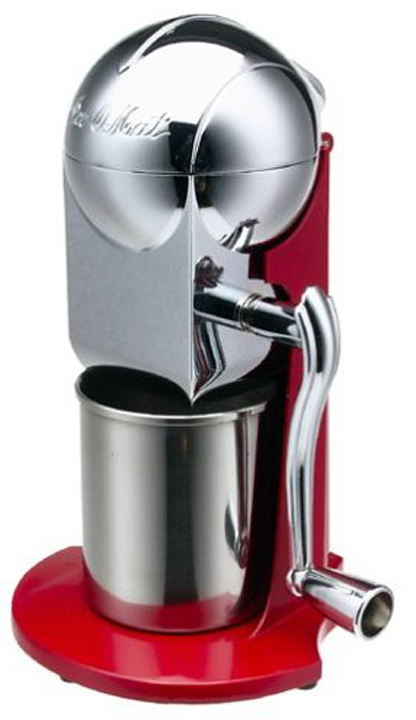 This particular machine has alighted dial on the back that allows you to verify thet the correct grind has been chosen. 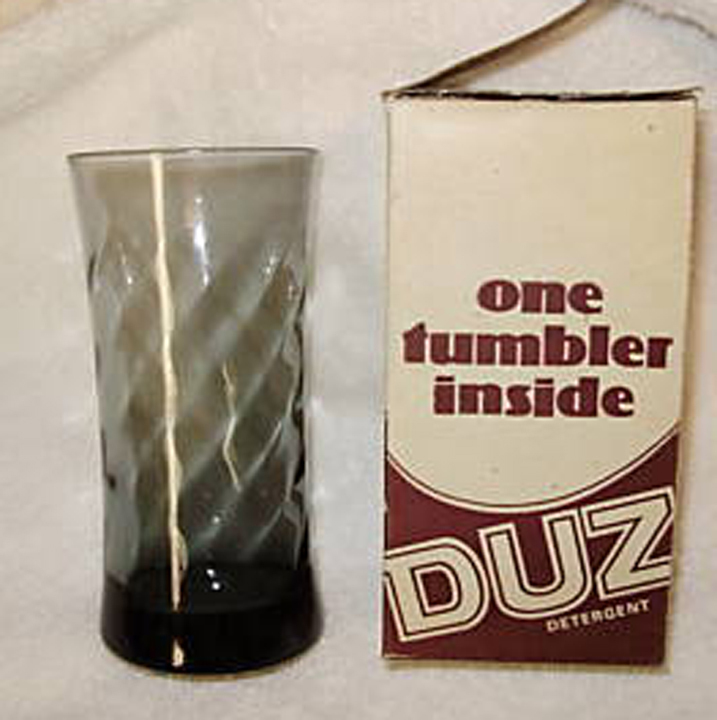 In the 1970s, these things went out of fashion. However with the resurgence of coffee snobbery, the in-store grinder and whole bean coffee have made a resurgence. Here are some photos of a very nice Roper Range from the 1940s sent to us by our friend Janice in the Chicago Area.
" 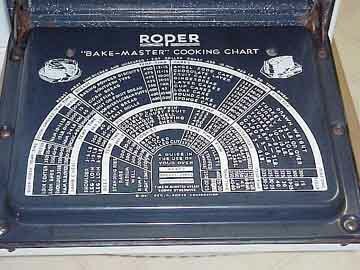 ...I believe that it is a 1952 model Roper Range. It's 36" wide. 40" wide was the standard width all during the 1940s. 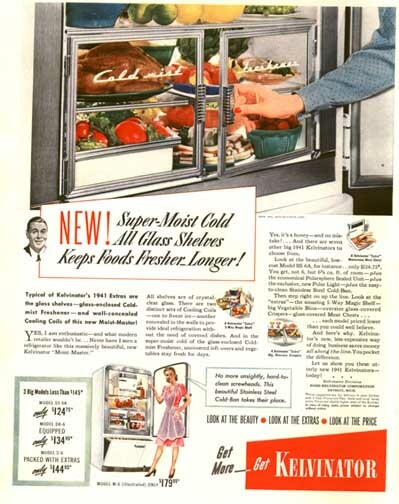 Then they shrunk to 36" in the early 50s (and the 30" was introduced in the early 50s - has been the standard size since the 60s)... and, the oven door is really cool!..." 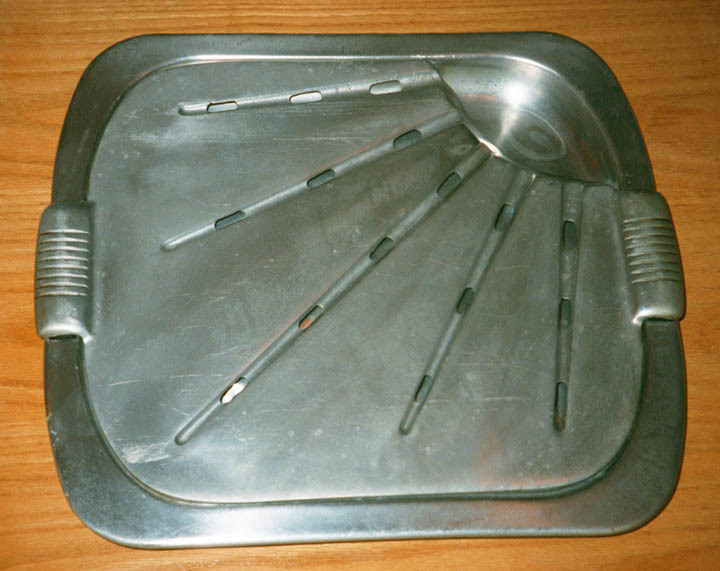 This is the broiler pan from a 1946 Roper gas range. Take a look at what is inside your stove and you will greatly appreciate the artistry in this object. Known as "The Sunburst", this particular object has made it into the collections of several Museums. There is one at the Cooper-Hewitt and at the Baltimore Art Museum. This is a very heavy aluminum casting in two parts --- a tray and a removable serving platter. 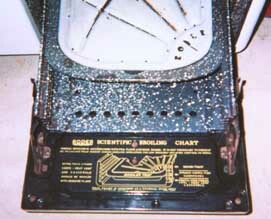 The "Sun" is a grease well and the "rays" are drainage channels. This is a wonderful piece of design. 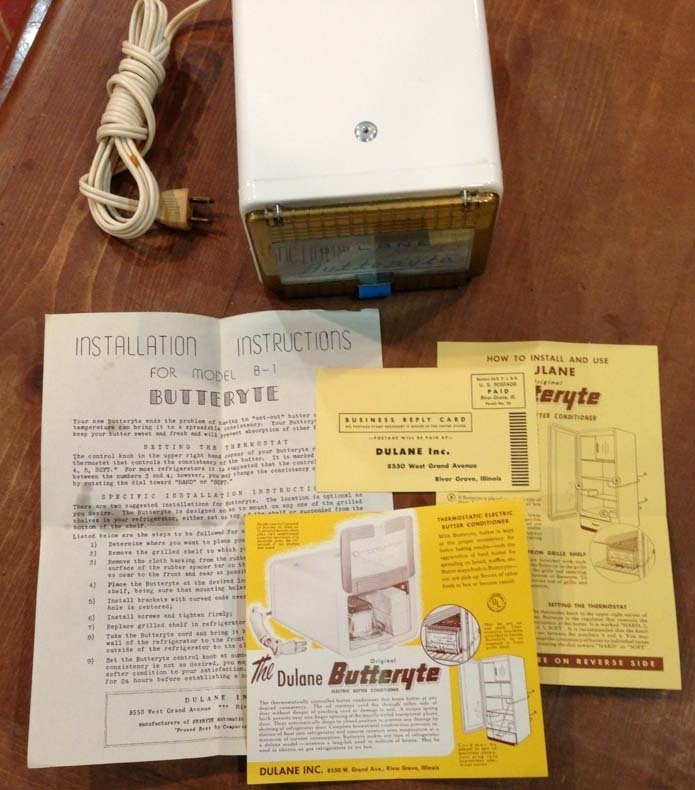 Click here to look at another type of collectible, or keep on scrolling for more kitchen appliances. 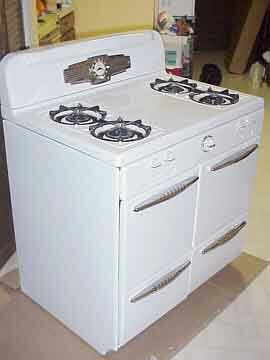 Here is a wonderful photo of a stove sent to us by our reader Dave. He writes, "... 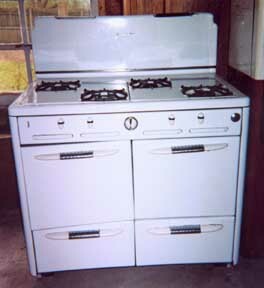 This is a 1955 O'Keefe and Merrit range with Double Ovens and Double Broilers with the ABC (automatic burn control) timer for the rear right burner...."
" ... Here is our 1951 Chambers Range Model C 60. Built in 1951, this fellow came from the original owner in Indianapolis and now resides in Huntington Woods, Mi. We installed a new thermostat and safety system, has all of the grates, drip pans and burners re porcelianed. The oven easily cranks up to 700 degrees ! 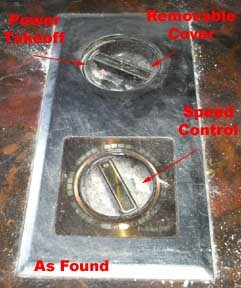 The broiler is recessed into the cooktop and is operated by the handle on the extreme left and the one to the right of it. The broiler pan height and the flame are both adjustable. This is truly a serious cook's dream come true range. [Rachael Ray uses one on her "60 Minute Meals" program on the Food Network] The insulation in the guy is so perfect, even at full blast, the exterior of the oven compartment remains cool to the touch. On the rear right of the cooktop is a lid which conceals the Thermowell which will hold a single, double or triple pot, a double boiler or a Thermobaker which turns the well into a second oven sized to accomodate an 8" round pan. .."
This was sent to us by 40s Phil who has an incredible collection of stramlined stuff out in Central Indiana, not too far from the Rutenber factory. 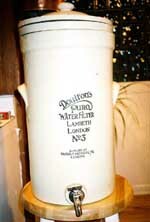 Phil writes:"Here's a 1940's Marion range with the 'deep well' cooking pot built in"
"Doulton-Lambeth Puro Water Filter, London #3"
Briefly, this invention saved England from the Cholera epidemics of the 1820s in which 30% of the entire population of London died due to bad water! [In addition, the Cholera epidemic was the first time that Statistics were used to discover the source of a disease.] 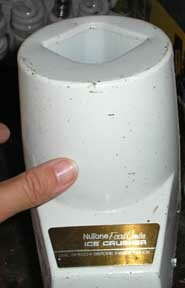 The ceramic "filter candle" is still used today in those Brita filters. 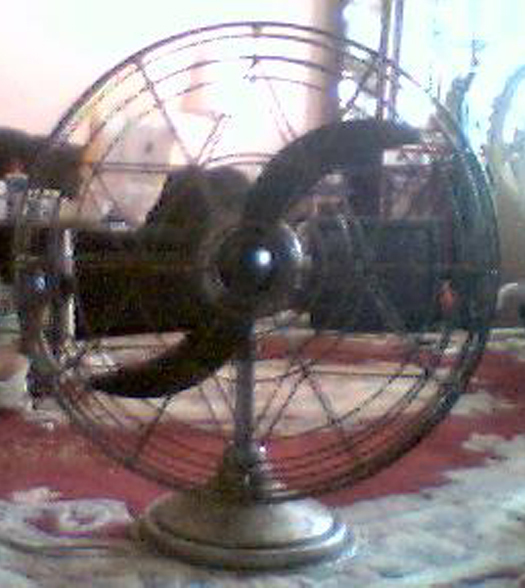 I do NOT belive that this is old; it appears to be a reproduction made in the 1970s. However, it works perfectly! I cannot believe that this thing made its way to me for FREE! 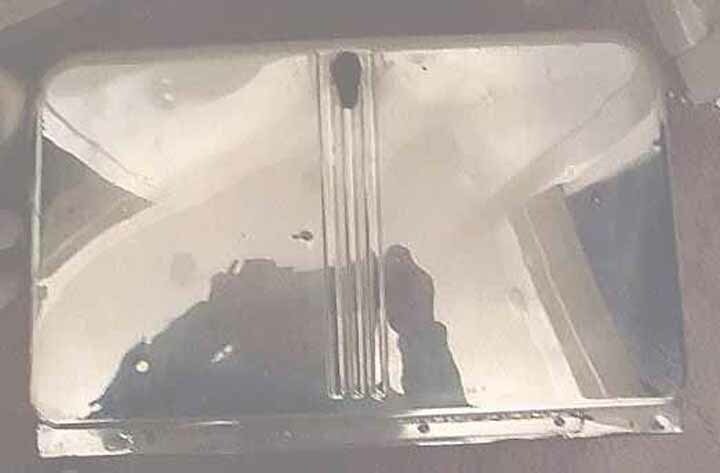 The photo above shows the "filter candles" on the inside. Click here to learn how the Filter Candle works. Keep your eyes out on Bulk Trash day!!! This is the opposite pole --- it is pure kitsch! It is a roasting pan in the shape of a streamlined locomotive. I like it as an example of "Gee Whiz" design, like my Click here to look at another type of collectible, or keep on scrolling for more Kitchen Stuff. The point of this discussion is that advertisers devoted a whole lot of effort to marketing appliances as "cook at the table" --- the pitch being that anything that was done at the table brought couples together. 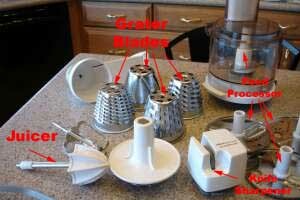 Do YOU know of appliances that are sold today as a "marital aid"? Haven't times changed??? So, this table model waffle iron is here to illustrate this sociological trend. It actually makes pretty good waffles! You might look at our Special Page that focuses on Waffles. 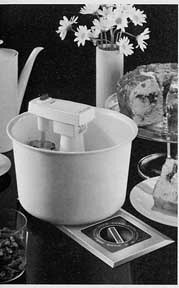 Following on the discussion of the waffle iron, above, this is another example of the "Togetherness" products marketed during the 1930s and 1940s. This particular item functions as a tabletop oven. 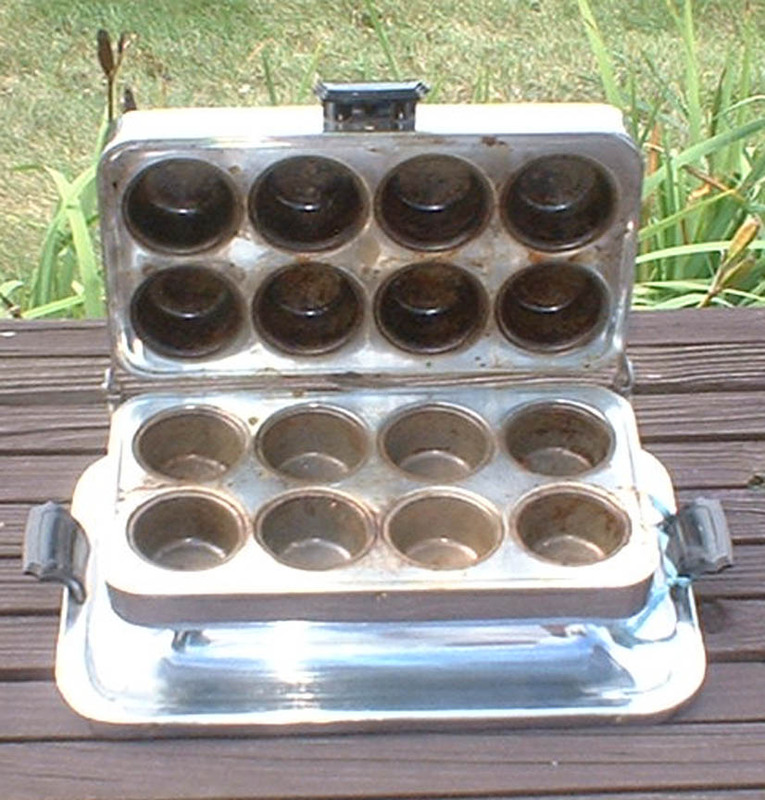 You can use it to bake six small muffins or a small cake. You can also poach eggs if you fill it with water. 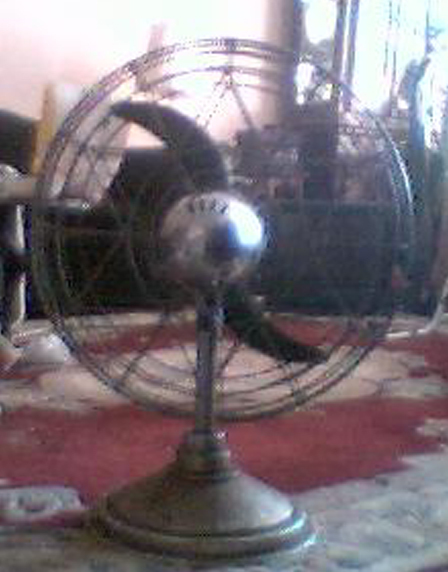 It actually works and is very nice on really hot mornings wehn you don't want to turn the oven on. I'm really happy with it. Vitamin C was isolated in the 1940s and sparked a nationwide craze for health through orange juice. The expense (and hence status) of fresh-squeezed orange juice also contributed to a flood of deco-inspired juicers. Here is a pair of such items. The "Big Squeeze" shown on the left has a lot of leverage and does quite well on grapefruit. The "Juice-o- Mat" on the right seems to do a better job on oranges. Only the latter has manufacturer information. 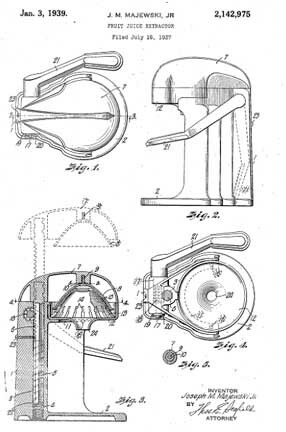 There was considerable competition in the marketplace as witnessed by three competing patents granted in the same timeframe. 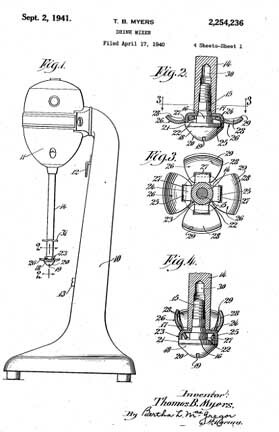 The Bloomfield patent (below) has survived to this day and may be seen in commercial establishments today. For all the criticism we have of Henry Luce's editorial policy, Life Magazine remains an excellent record of life in the 1930s and 1940s. Recently, we attended a yard sale and came away with a gigantic box of these magazines. We were drawn to a photo essay on how World War II was affecting "An American Block" in Hamilton, Ohio (November 8, 1943) The article provided photos and interviews with "typical American" families along one block in this small, mainstream town. The major themes were present -- concern for loved ones in the service, complaints about rationing, changes in routine since women went off to work in defense plants. However, we also noted some unusual things from the perspective of 1998 (when this was originally written -- or from 2010 for that matter). Specifically, the photos documented people who led a very sparse existence. The living rooms shown had a few chairs and not much ornament on the walls. Kitchens were plain and utilitarian. Of note, all the men photographed had very well-shined, but obviously old shoes. In the midst of the discussion about the war and sacrifices, came a comment from Mrs. Ida Kunzelman who had experienced the thrill of her first paycheck. She noted that she planned to buy a pressure cooker. In the context of the war, this seemed a bit odd. From our 20/20 hindsight, it seems that other things might be higher on her list of priorities. 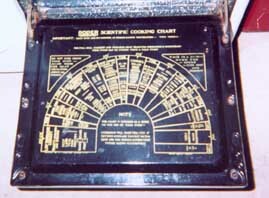 Plus (as we found out later), pressure cookers were made of aluminum which was very scarce due to its use in aircraft. Acquisition of such a device would have required considerable financial sacrifice and possibly even dealing on the Black Market. So, we were left with the question, "What is so desirable about a pressure cooker?" This question remained unanswered until we attended yet another estate sale. Sitting amidst the kitchen detritus was, of all things, an old pressure cooker. We offered fifty cents for the thing and took it home, to examine it as an historical artifact, with the hope of gaining some insight into Mrs. Kunzelman's motivation. The thing appeared to be old, because it has wooden handles; my memory of these things is plastic handles, so it was a safe bet that the thing dated from before 1950. Unfortunately, on the subject of Mrs. K's motivation, we found it to be singularly mute, although it is obviously made to last --- the aluminum casting is graceful and about half an inch thick. You probably could have made the whole wing of a Dauntless dive-bomber out of the metal in this baby. So, what do you do when you want to learn something these days? Simple: crank up your search engine and enter "PRESTO PRESSURE COOKER". Within five minutes, I was looking at a picture of the object that I had before me. You can view this also by simply accessing the website of the National Presto Corporation. The company was founded in 1905 in Eau Claire, Wisconsin. 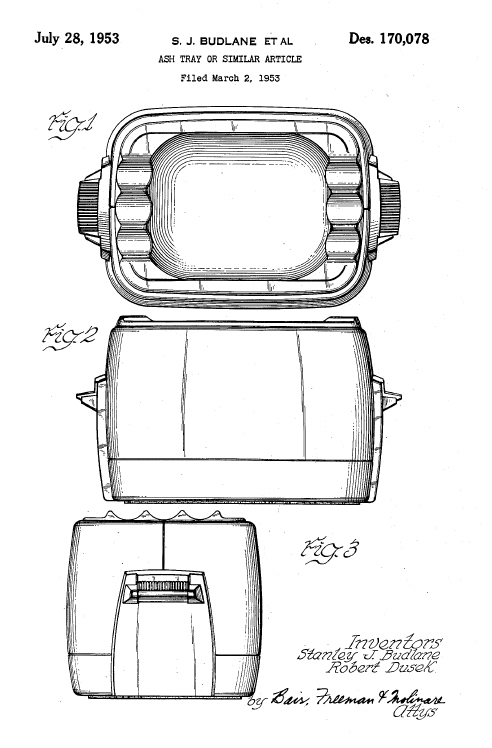 It manufactured industrial-size pressure canners, known as "canner retorts," for commercial canneries. 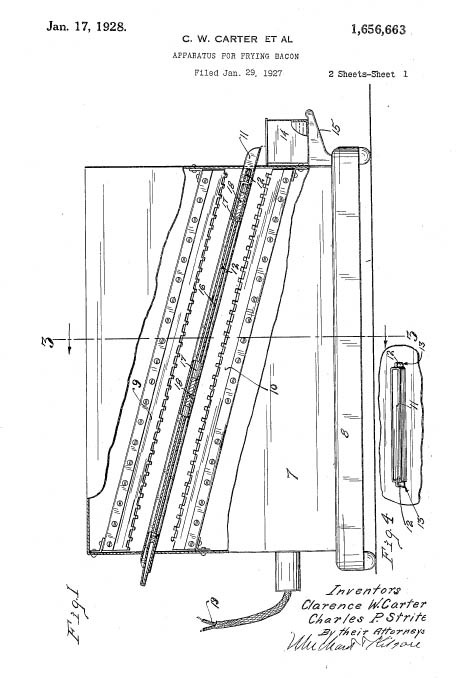 At that time National Presto, then called Northwestern Iron and Steel Works, was a major producer of fifty gallon capacity pressure canners. Subsequently, the company also began production of thirty-gallon canners for hotel use and soon thereafter developed ten-gallon models suitable for home canning. 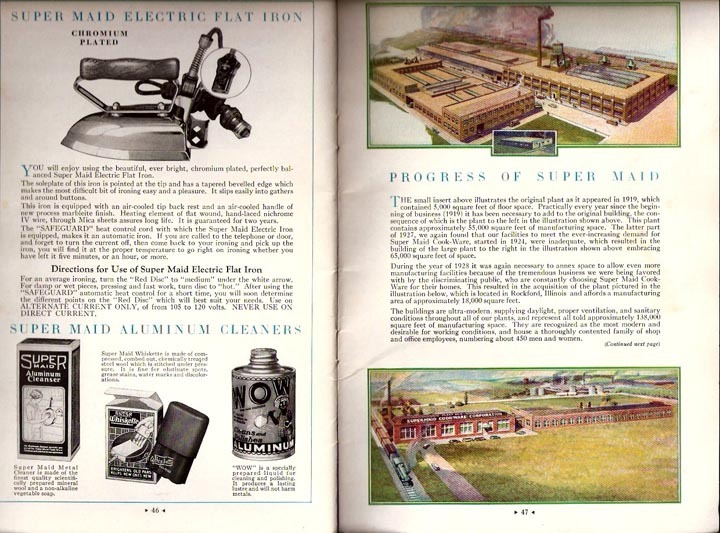 In 1915 the company installed an aluminum foundry for the specific purpose of manufacturing large-size pressure canners for home use. When, in 1917, the United States Department of Agriculture determined that pressure canning was the only safe method of canning low acid foods without risking food poisoning, all commercial canneries were forced to equip themselves with facilities for the pressure canning of their products. 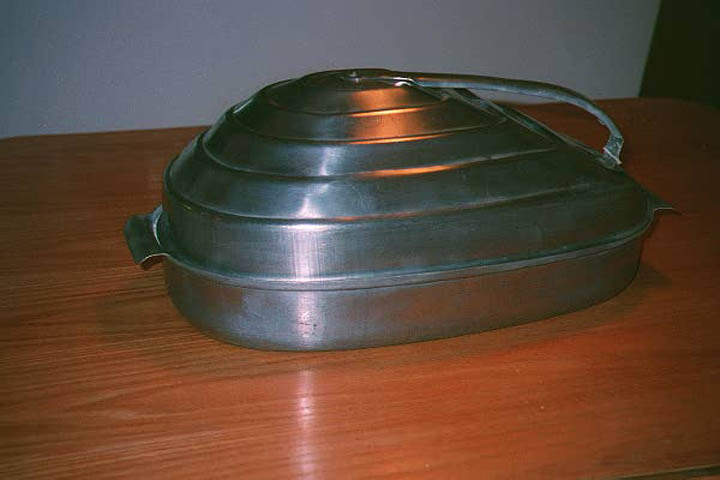 During this period the company became one of the largest manufacturers of cast aluminum cooking utensils in the world. 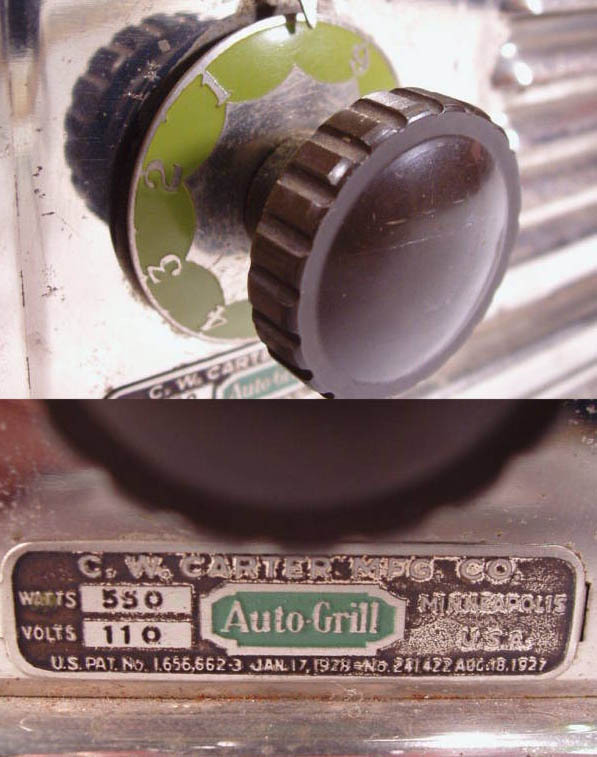 Its products were marketed under the trade name "National," and the company name was changed to "National Pressure Cooker Company" to more closely identify with its famous brand. With its vast experience in manufacturing pressure canners and to more adequately meet the needs of the consumer, in 1939 the company introduced the first saucepan-style pressure cooker and gave it the trade name "Presto." 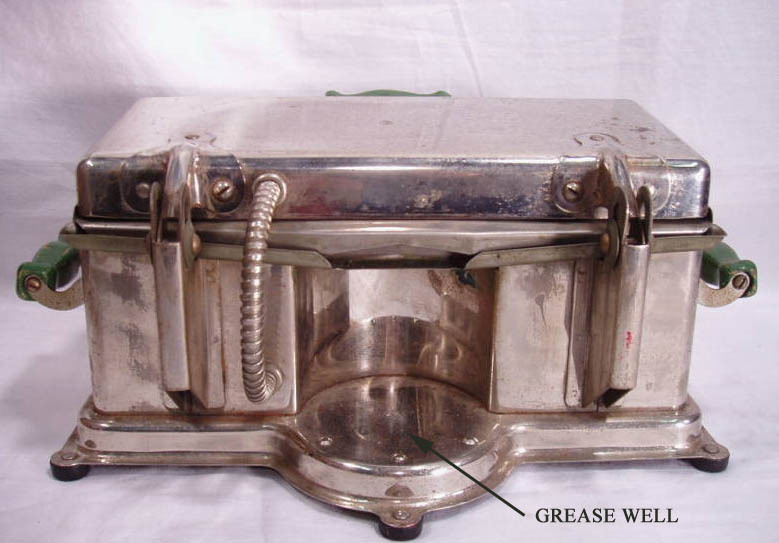 (and, it is this model that we have acquired) The Presto brand soon became synonymous with pressure cooking, which represented to the American housewife a method of cooking in one third the time while maintaining the vitamin and mineral content of foods and saving both food flavor and color. 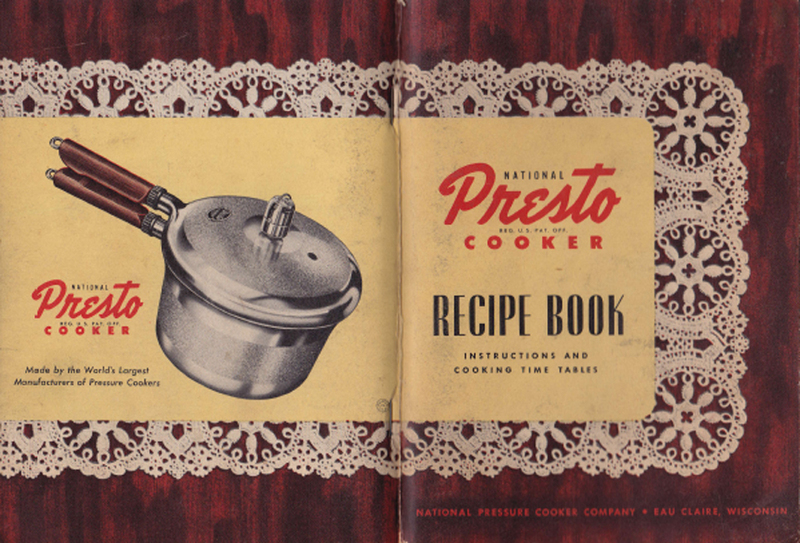 So great was the consumer's acceptance of the Presto pressure cooker that in 1941 facilities at National Presto were dramatically increased. By the end of the year, the Presto cooker ranked among the largest producers of housewares dollar volume in leading stores throughout the country. 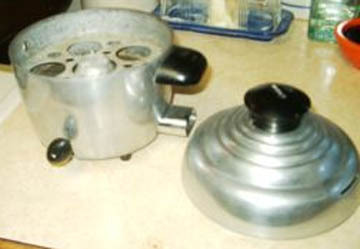 World War II, however, brought a temporary end to the manufacture of pressure cookers as well as other cast aluminum cooking utensils. Quick to cooperate in the war effort, the company converted almost all of its production facilities into war work, manufacturing artillery fuses, aerial bombs, and rocket fuses. It became the first to manufacture rocket fuses on a mass production scale and was also one of the first companies in the state of Wisconsin to receive the Army-Navy "E" Award, receiving five such awards during its wartime operation. Throughout the period of World War II, the company continued to manufacture canners for the extremely important victory garden and canning programs. 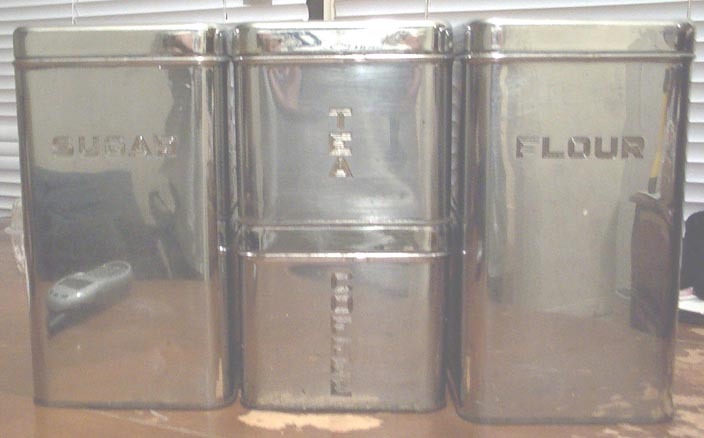 Materials for these canners were provided by the War Production Board, and the canners were made of steel since aluminum was not available. With some correspondence with the folks at Presto, we were able to establish that our artifact was one of the 1945 4-quart models. 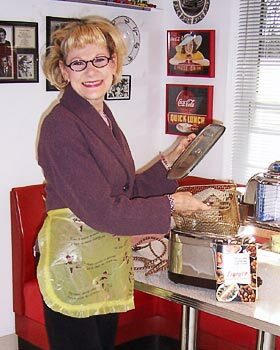 The people there said that Mrs. Kunzelman probably wanted the thing so that she could continue to make traditional meals while working at the defense plant, because pressure cooking allows dishes to be prepared in about a third of the time. So, Mrs. K had many of the same problems faced by traditional two-career families. We guess that there was no Boston Market, Fresh Fields or their equivalent at that time (in 2010 both of these chains had ceased to exist, but Presto was still manufacturing pressure cookers). There really is nothing new under the sun... We wonder if Mr. K got a lot of jive about helping out around the house --- a 90s man was probably needed in the 40s. As an afterthought, that wonderful story on the "American Block" -- and it is, indeed, truly charming --- is in an issue that features Jan Christian Smuts on both the cover and in a lengthy glowing story. Gen. Smuts was the architect of South Africa's apartheid policy. Our opinion of Henry Luce has not changed one bit. We are eternally grateful to our reader Roberta for sending us a scan of an entire Presto manual from the general time period of our collectible. "... We now have crock pots and microwave ovens for these sorts of things. "...Here's a question for you. 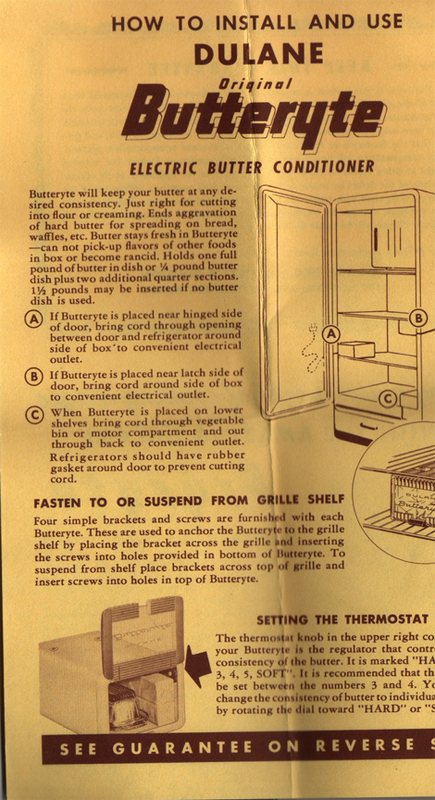 Before the days of electric refrigeration, what was the official "ice box etiquette"? You remember your mom always telling you to close the refrigerator door and eat the leftovers before making new food. But what special things had to be done in the days before refrigerators? Was there special emphasis on cleaning the plate because there was little room for leftovers? Was ice cream seldom consumed at home because of storage? Was the timeline on cooking meat tighter? Were you never allowed to open the door unless it was absolutely necessary? Any funny family stories about ice blocks?..." In 1997, I took a trip to Solomon's Island to attend a Rockin Bones gig. 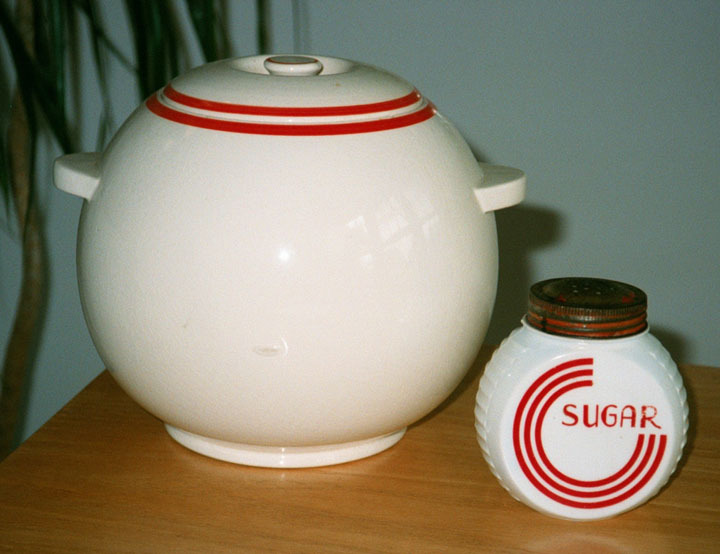 (By the way, their new CD is fantastic...) I found this cooky jar and sugar shaker at a yard sale. I make ginger snaps, dust them with sugar, and store them in the jar. They don't last long. 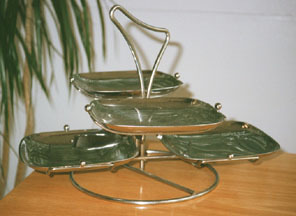 This lovely chrome lazy susan is out of a Chase Art Metal catalogye from the 1930s. It is used every morning to carry all the accoutrements of breakfast around the table. Mrs. Levy gave us this aluminum lunch pail --- including the Thermos in Safety Orange. She carried this object to work during World War II when she worked in a defense plant in Sparrows Point. 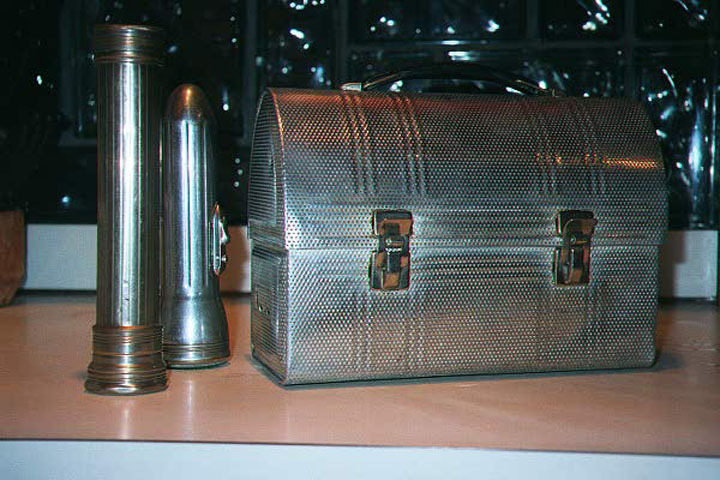 Thus, it is an authentic "Rosie the Riveter" lunch box. 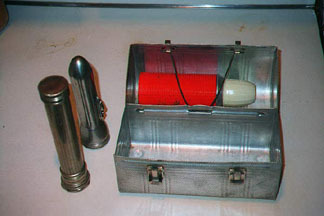 We have shown the lunch pail with an Eveready and Raytheon flashlight of the period. Art was not limited to the Upper Classes. All of these are stylish, well-constructed objects that serve their intended purpose superbly. We found this gorgeous tea set at a yard sale. Actually, the aluminum covers were in one box and the teapot, creamer and sugar were in the other. I am grateful to My partner, who was smart enough to put them together. We paid $4 for the set. The set is marked "Made in England --- Celtic Beehive". My partner guesses that it dates to the 1930s. 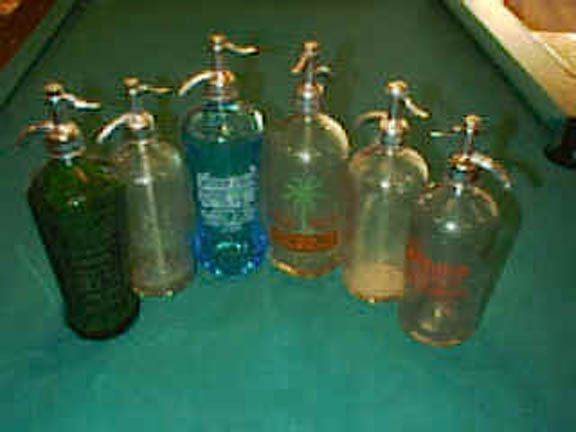 This is a Lincoln Beautyware cannister set that we have been collecting --- one piece at a time --- for about a year. As usual, this starts with something that you get practically for free. 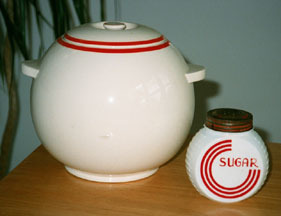 In our case, the "Sugar" cannister was found for a quarter at an estate sale. The "Coffee" and "Tea" were found in our trip to Mercersburg ($1 for both), and "Flour" came from the Episcopal Thrift Shop in Chevy Chase ($1). Finally, the Cake Cover ($3.00) came from our recent trip to Hampden, a Baltimore neighborhood. O.K. --- There's a story here, not just a chance to show off our cannister set. The set depicted here is the High Class "Art" version that was made in the mid 1940s. Each item is made of stainless steel. 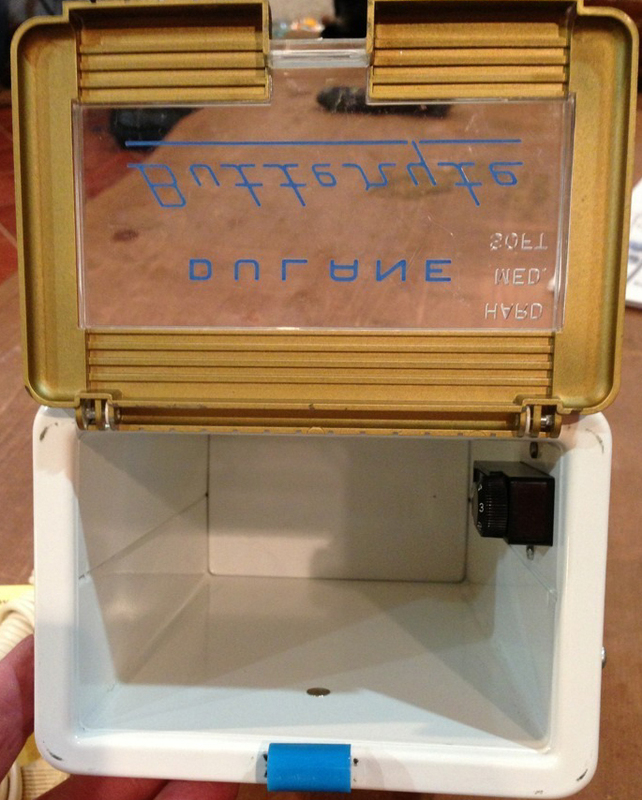 The tops have retractable hard rubber handles and the lettering is on an enameled brass plate riveted to the cannister. This was a fairly expensive item, and considerable attention went into the design and manufacture of each piece. The materials are very good and there isn't a speck of rust on any of the pieces. 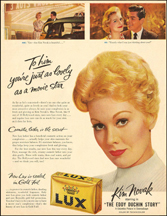 Each piece is plainly marked "Lincoln Beautyware". We have found that this company's primary product line is stainless steel objects for use in medical facilities, particularly operating rooms, so we are not at all surprised at the quality and durability of the product. However, as we have been sensitized to this particular product line, we have noticed that this particular set has been widely counterfeited! 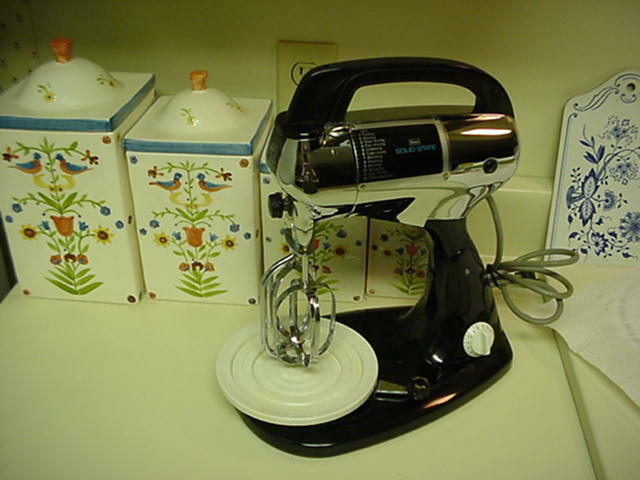 It seems that this made a big hit with upscale homemakers when it was introduced, and spawned a whole lot of "Copy Cats". We have seen them in aluminum (full of dents), pressed tin (rusted) and even plastic. The proportions are about the same, but the gorgeous details, especially the enameled brass plates and retractable handles is missing. The aluminum versions try to emulate the typeface with paint, but later versions only emulate the shape. 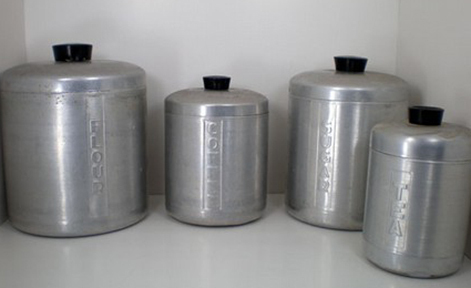 These are a great addition to any kitchen --- but, beware of imitations. It would be worth your while to pay up to $50 for a complete, authentic set if you don't want to wait. Beware of low quality imitations. 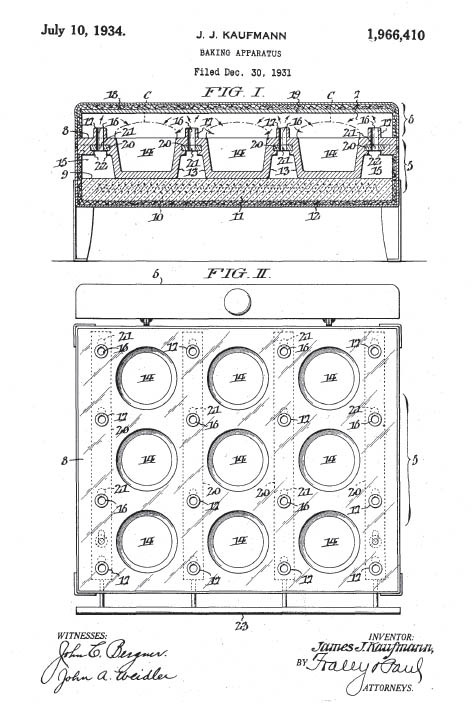 The basic design for the Hamilton-Beach Mixer was patented on December 26, 1939 -- a small "post-Christmas" present from the Patent Office to the lovers of sweets everywhere. The designers were James F. Barnes and Jean Otis Reinecke of Waterbury Connecticut -- they were employees of the Scovill Corporation which was acquired in 1940 by Hamilton-Beach. 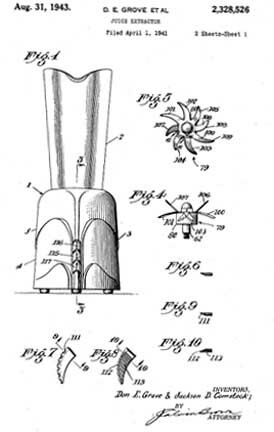 They received Design Patent 118,225 for their effort. 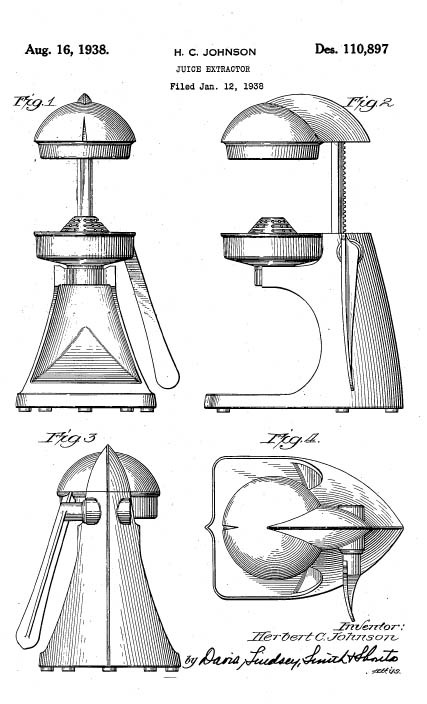 The fully perfected Milk Shake maker relies on the genius of Thomas B. Myers and Arthur W. Seyfried who invented the little Agitator (bottom) and Aerator (top) that enable this wonderful machine to churn ice cream and milk into a creamy and frothy delight. 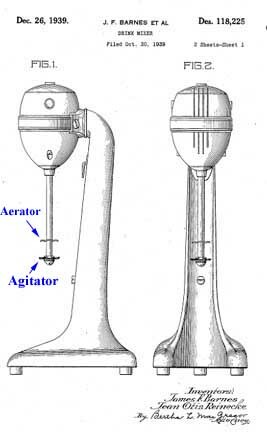 The full flowering of the mixer was not attained until Seyfried emplaced the aerator in 1942. Science and American Ingenuity will always triumph! Here's a recipe for my favorite drink: Put chocolate ice cream into the can up to the first mark. Put chocolate milk in up to the second mark. Add two tablespoons of Hershey's chocolate syrup, two teaspoons of malt sugar and one raw egg. Mix until the emulsified mixture almost fills the can. OK, I know there are health food freaks out there who are worried about Salmonella. I used to drink two of these a day at Patsy's in Bloomfield (a Pittsburgh neighborhood) from age 12 to age 26 (when Patsy went out of business...) and I never got sick. Since I got the milk shake mixer, I have had one a day and no problems. Of course, I grew up in Pittsburgh... I am probably immune to everything. Only Yuppies live forever. 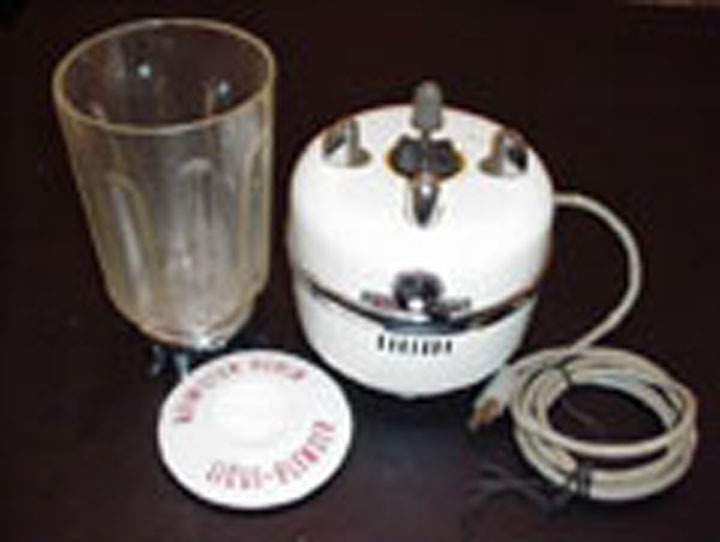 Here is a photo of a mixer made in the 1960s and distributed by Sears. It has a number of the features of the Hamilton-Beach, but with "space age" styling. Thanks to our friend "Acme Ron" for sending it in! 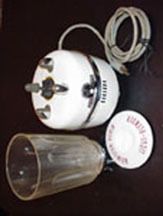 The upper picture is a Hamilton-Beach Model 6 Blender from the early 1950s. The next picture is Model 5 from the same company. All show the influence of Rocket Ships and Space Travel that was beginning to obsess the country after WWII. This is another appliance that was made to last -- the heavy base is enameled and everything dis-assembles so it can be repaired. We found this model at a garage sale and walked away with it for fifty cents. 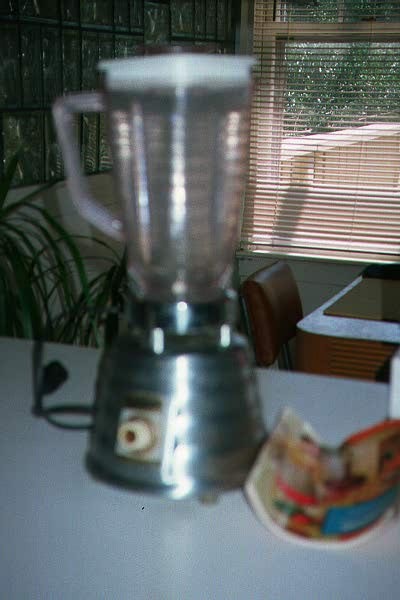 There isn't a mark on the thing and it has about ten times the power of contempoary blenders. We really like the styling. Although this model entered the market in about 1952, we believe that the design inspiration is pure Post War "Rocket and Space" themes. 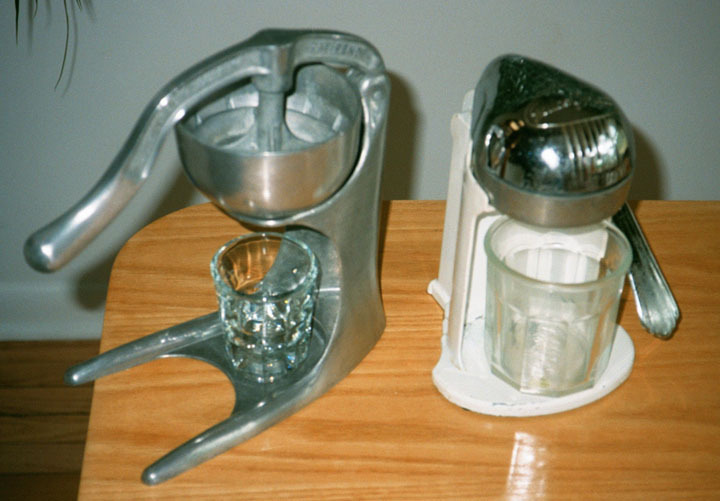 The incredibly powerful motor, we believe, is there because of the Daiquiri fad --- this is an alcoholic drink that can only be made in a blender by crushing ice with rum, lime juice and sugar. Since we don't drink, we'll offer another recipe: By over-ripe banannas at the supermarket on deep discount. Peel the fruit and place it in small plastic bags and freeze until hard. Place one frozen bananna, four ice cubes, a cup of skim milk and a teaspoon of malt sugar into the blender. Churn until smooth. This creates an illusion of a milkshake that we drink when we have had too many of the other kind of milkshake. Don't try this with a cheap plastic blender. 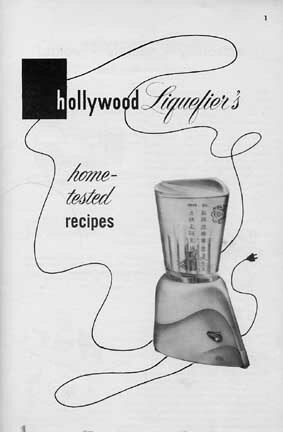 These were made by the Hollywood Liquifier Co. Ltd. of South Pasadena California. 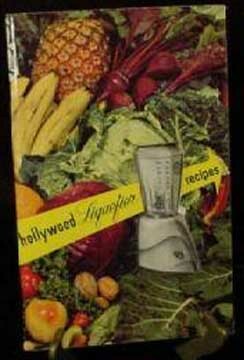 The word "Hollywood" came tio be associated with Movie Stars, Glamour and physical fitness. One of the pervasive myths about "Hollywood" was that the film industry had access to medical secrets that could keep a person young indefinitely. Although in reality film stars only had access to expert photograph retouchers, "health food" was widely touted as the Fountain of Youth. A large part of this was the consumption of juices made out of every kind of plant and animal. Given this, it is only logical that the device used to create these magic elixirs should also acquire Hollywood cachet. Indeed, this blender has something magical about it -- to me, it says "Las Vegas" or "Rat Pack". It belongs in the same genre as those late 50s Chrysler Imperials with little satellites as tail lights. 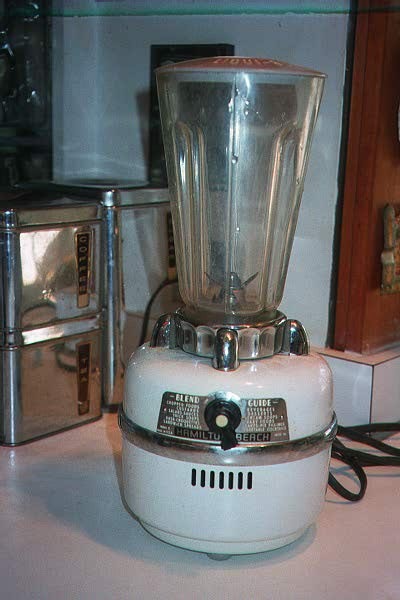 Where the Waring or Hamilton-Beach blenders have a "fat" base, this one is curiously thin, embodying a triangular cross-section. 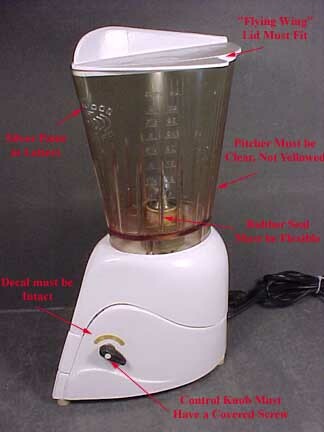 Who knows, maybe people who wanted to reduce would take one look at the thing and decide to buy a slender blender. 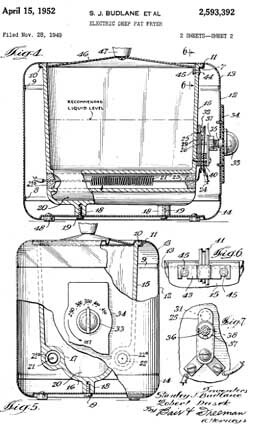 The interior of the gadget was designed by Donald E. Grove and Jackson D. Comstock in 1943 and together, these folks became the Hollywood Liquefier Company. 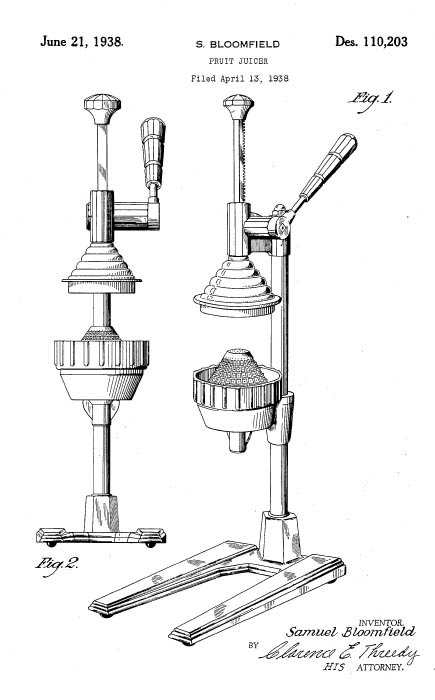 Grove and Comstock's Patent for the "Hollywood Liquefier"
From the patent diagrams, the Blue Blender (right) is older than the White Blender! 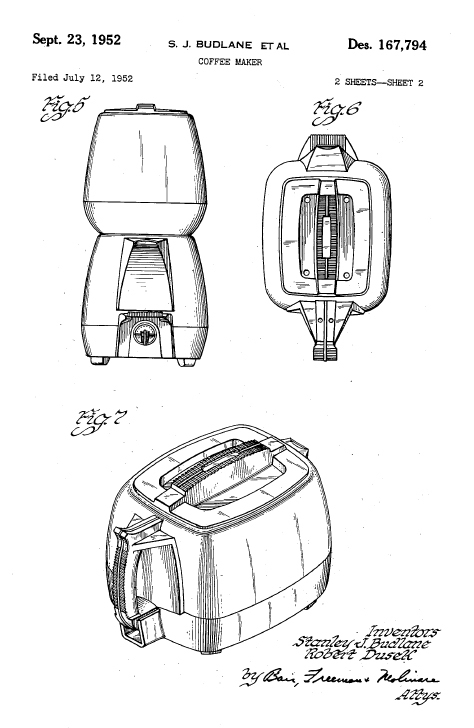 In the late 1940s Sol Rosenthal did an exterior design that simplified the piece, removing the push-button controls. This was done most likely to reduce manufacturing costs. 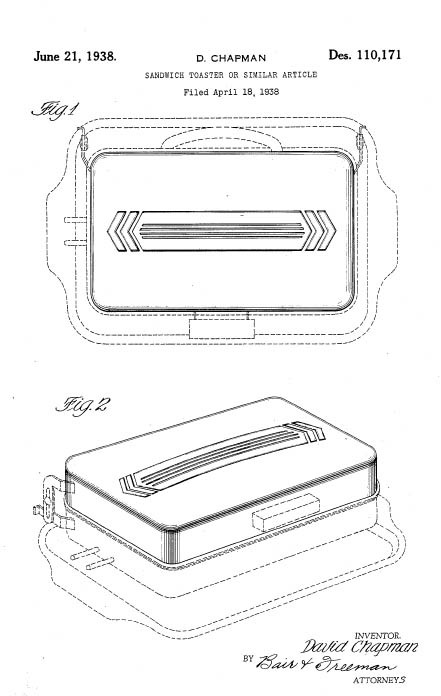 Sol Rosenthal's Design Patent for the "Hollywood Liquefier"
The gorgeous "wing-in-flight" lid for the pitcher is made of a curious white plastic material that will shatter if it is dropped from a height of more than one foot; hence, the lid is often missing or cracked. The pitcher is is made out of another kind of "biodegradable" plastic -- it is very often yellowed with age or warped to the point where the lid will not fit onto it. 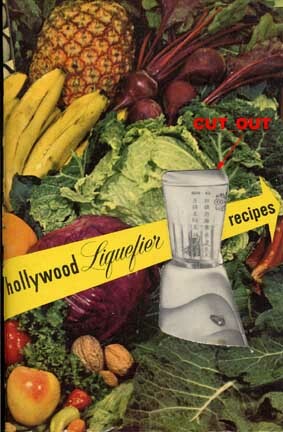 On the original versions, the embossed words 'Hollywood Liquefier' had original silver metallic paint in the letters. This falls out very quickly. The blades are apparently made from used tinfoil; they become scratched and scuffed very quickly. The white rubber seal that mates the Pitcher and the power base will harden, crack and permit leaks. The decal for the power settings can be scratched or scrubbed off very easily. 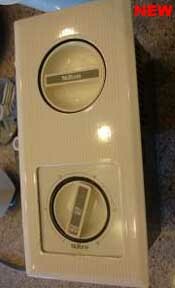 It should read "Off-Low-High"
The cord cracks easily; the original power cord had the word "Royal" molded on it. Because so much can go wrong, these items are extremely rare, and often bring high prices at auction. You should be very careful about condition before you pay a lot of money and you should examine the object on the above points very closely, preferably with an expert at hand. If you buy one, do not ever use it -- it will self-destruct before your very eyes. Buy this strictly as a piece of sculpture! 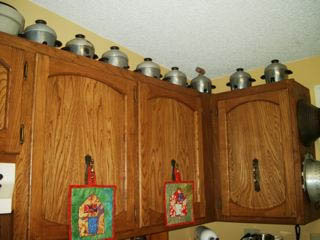 When my Dad and I were in the Kitchen Business, we installed a few of these, only in the hoomes of very wealthy people. The idea did not catch on because you only traded counter-clutter for drawer-clutter. Also, buying all these appliances from one manufacturer made you captive to them. 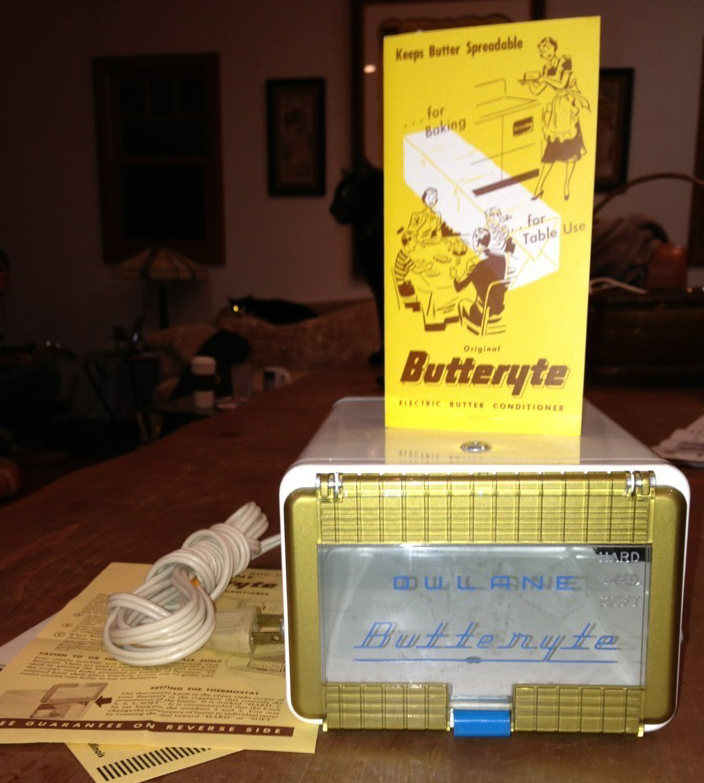 The Nu-Tone company does not make these anymore, although you may be able to find them on internet auctions. Thanks to the great kindness of our friend "Acme Ron" in Phoenix, I now have a ".pdf" of the manual -- Contact Me if you want one. A long time ago, Daniel Fierer told me that, on impulse, he had purchased a silver art deco martini set at Sloane's Auction Gallery. We shared some amusement because neither of us drink alcohol. Alas, the martini cocktail is inextricably linked with the late 1920s and the 1930s, a period where economics forced fashionable young couples to give up servants and entertain on their own. 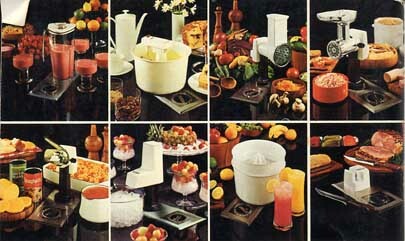 If you couldn't afford a butler, you could "treat" yourself to an artistic cocktail set and make the preparation of drinks a part of pre-dinner festivities. Also, during Prohibition, the cocktail bar was usually hidden in some object of furniture (mine is a coffee table); you never knew when Aunt Minnie the temperance firebrand might show up. Well, it seems that the Martini is back in style -- lord knows how many "Martini and Cigar" bars have opened in town. And, it seems that many of our new converts to swing have come to us through the "Martini Nation." Well, let's make it clear that I don't drink. On the other hand, cocktails were a really essential part of sophisticated entertaining during the Swing Era. Right after the first World War, people began living in Big Cities in Small Apartments. This meant "No Servants" --- and entertaining took on a "Do-it-yourself" character. It was quite elegant to drag out artistic implements and prepare exotic mixed drinks for guests while making witty banter during the process. The advent of Prohibition only added glamour to the cocktail ritual. In the 1930s, President Roosevelt gathered his closest aides to his side promptly at 4:30 pm for something called "The Children's Hour" --- during which the President himself would mix dry Martinis for the ensemble. 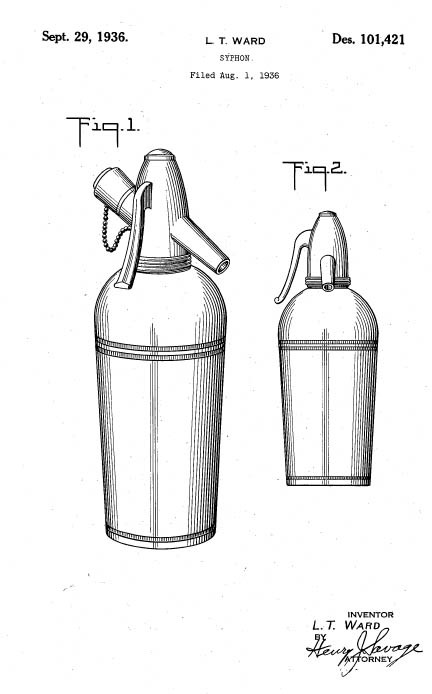 The "Sparklet Syphon" seltzer bottle recognized that carbonated water is essential to many mixed drinks. 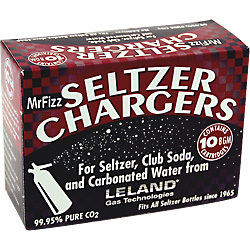 Prior to the 1940s, carbonated water ("Seltzer") was prepared at factories from calcioum carbonate salts (Hence the German word "Seltzer"), stored re-usable in Syphon bottles and delivered to the consumer. Here's a Video to tell you more about this. If you have one of these and want to use it, you will need "triple filtered 8 gram CO2 cartridges" that are currently available from the Leland Company under the "Mr. Fizz" brand. Today one of these items in good condition could be purchased for about $75. 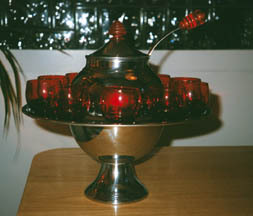 More about this item may be found in Art Deco Chrome by Jim Linz (Schiffer Books, ISBN 0-7643-07444-4) P 103 About the Chase "Gaiety"cocktail shaker: The cylindrical shaker was item No. 90034 in the Chase Art Metal catalogue, beginning in the late 1920s. 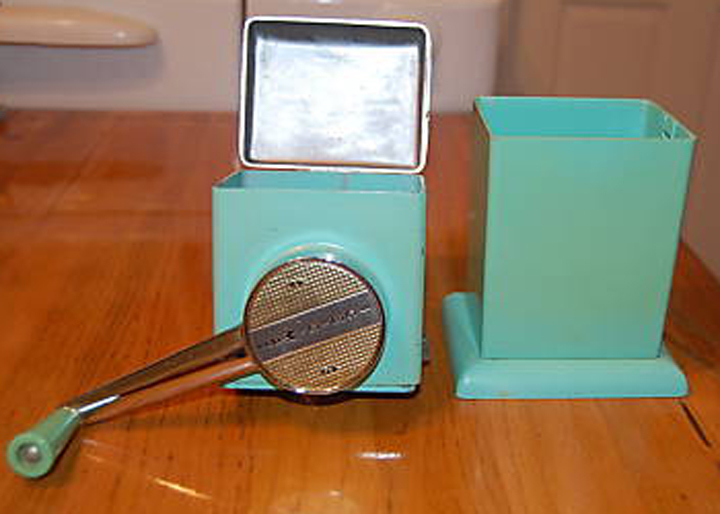 This particular shaker was featured in ads for Kool cigarettes as one of the premiums available to smokers. As a result, this particular item is more-or-less readily available. In good shape, they are worth about $50. 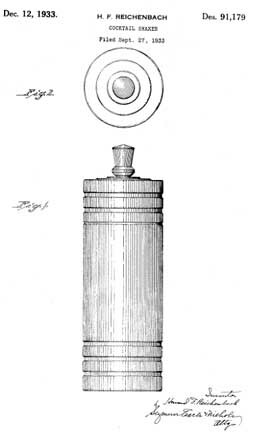 This cocktail shaker was designed by Howard F. Reichenbach who obtained patent No. 91,179 for its design on December 12, 1933. Martini Glass: In the foreground is the classic Martini glass. You hold it by the stem and the drink does not warm up. Plus, your onion or olive looks just swell at the bottom. This particular glass came from the very last night of the old River Club in Georgetown. Well, I'm not Aunt Minnie, but I don't drink and don't encourage others to do so. On the other hand, the romance of the Martini---the ritual, the perfect conical glass suspended on a thin stem, the olive---all of these things are actually quite artistic. So, without further ado, I offer you a way of having your Martini without the alcohol. In the upper part of a double boiler, mix a pint of clam juice with a tablespoonful of canned consomme. Warm until the conomme melts, mix well and add a half a teaspoonfull of worcestershire sauce, half a bay leaf, and a couple of dashes of Angostura bitters. The result will be a muddy looking mess of repulsive aspect. To correct this, beat into the warm mixture the whites of two eggs, entirely free of yolk. Turn up the heat and let the water in the lower half of the double boiler boil for half an hour. As the egg white congeals, it collects every particle of suspended matter. By simply straining the liquid through a fine cloth---a handkerchief is excellent--it comes out clear and sparkling. Chill this very cold and it is completely indistinguishable from a gin Martini. Indeed, a sensitive chemical test would be required to determine that this is not, in fact, a real Martini. Simply put this concoction in your gin and vermouth bottles (but--keep refrigerated) and you may perform the ritual of Martini making. Since there is no gin to "bruise" you may make your Martinis either shaken or stirred. Use olives not onions. Best of all, this potion is extremely nutritious! 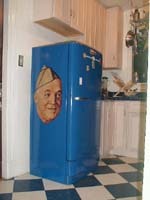 Fridge Facts: 1949 General Electric model nbx-8-fb refrigerator with freezer; electrostatic blue enamel finish added 1999; jumbo photo-magnet of "Hap" also not an original to the fridge. 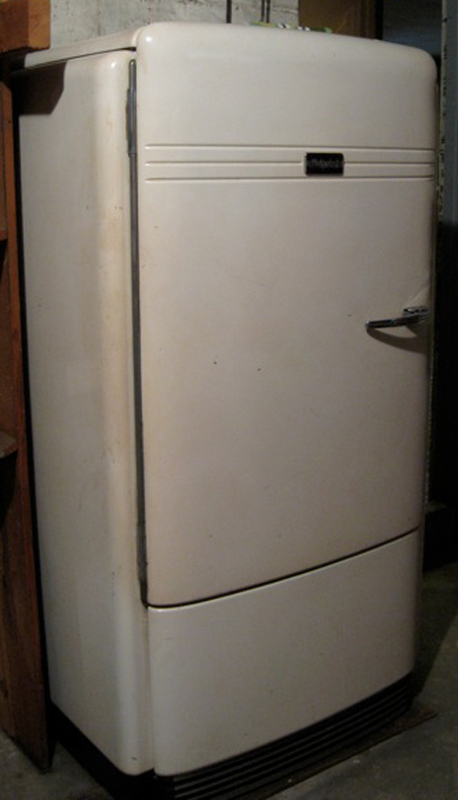 Fridge story: The enormous contemporary fridge that conveyed with our tiny 1931 house was relegated to the basement when a 1949 General Electric with a new compressor appeared at an estate sale. The original white finish had long since lost it's luster and gained a patina of basement grunge, so we had it electrostatically painted in blue enamel, save for the big shiny handle and the G.E. logo badge on the front of the door. A call to G.E. found that an original replacement gasket was also available for four times what we paid for the fridge; we opted to make do with a near-match from stock and invest the savings in more Lindy lessons. Miscellaneous comments: By the way, everyone's stock comment about old refrigerators is that they use a ton of electricity; this one costs about $7/month to run; maybe it's the new compressor, but between our 1930's gas stove and 1949 fridge, we've invested $45 in appliances so I figure we'll be ahead of the game for quite a while. As to the electrostatic paint job - this is a painting method that is generally used to repaint metal office furniture; it involves a spray-paint application that magnetizes the metal to be painted and the paint itself resulting in the paint literally being attracted to the object; the paint is a hard enamel and can be made in any color you can find on a paint manufacturer's chart. They'll tell you it has no overspray, but they're wrong; after having the fridge painted in our living room, it took a day to scrub the fine overspray off of every surface in the room. 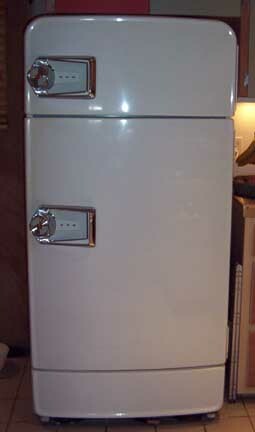 Dave writes: "...This is a 1955 General Electric refrigerator with the separate temperature control butter compartment (shown on the interior door photo). 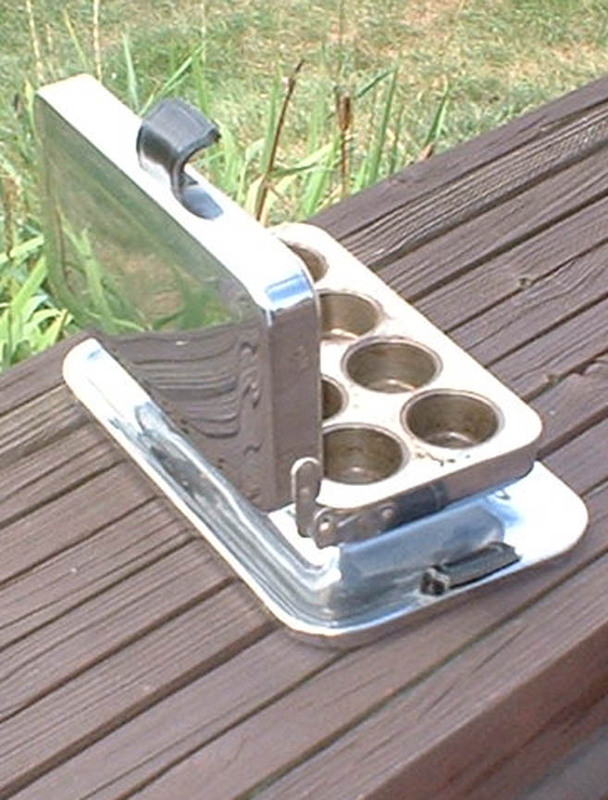 It has the 15 egg aluminum tray holder below the butter compartment,and the swing out cheese basket. 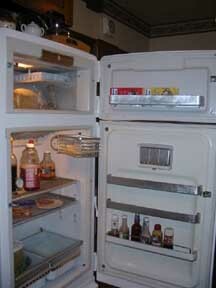 And, believe it or not, the Refrigerator is more quiet than the modern one it replaced. 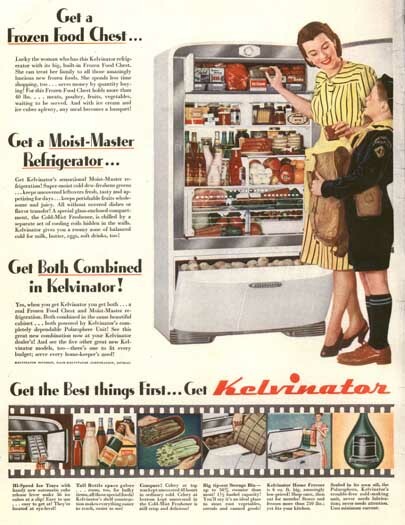 And since the original insulation, from the 1950's was far superior to the modern stuff, it is very competitive for efficiency to the newer models..."
From time-to time, we will augment this discussion with ads for refrigerators. They certainly played a big role in my childhood. Perhaps these ads will remind you of yours. 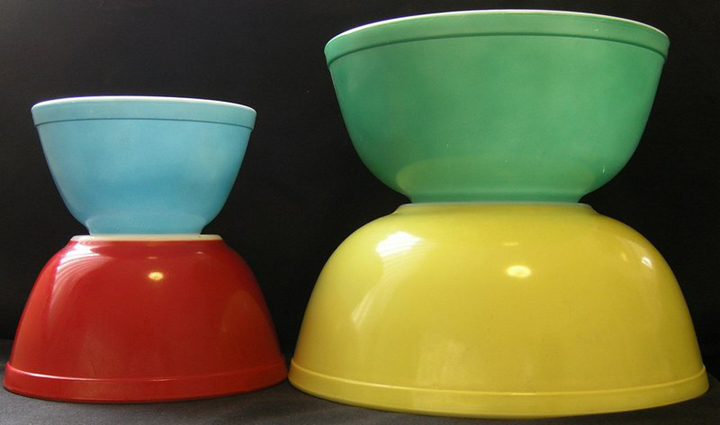 Wagner Ware is sold under the name "Magna Lite". This stuff is the highest quality kitchenware that you can get. It is thoroughly beautiful and works with spectacular results. The picture shows three of the most beautiful and classic pieces: the Roasting pan, the Griddle, and the Tea Kettle. These are very utilitarian objects with sculptural lines. Buy them any time you get the chance!